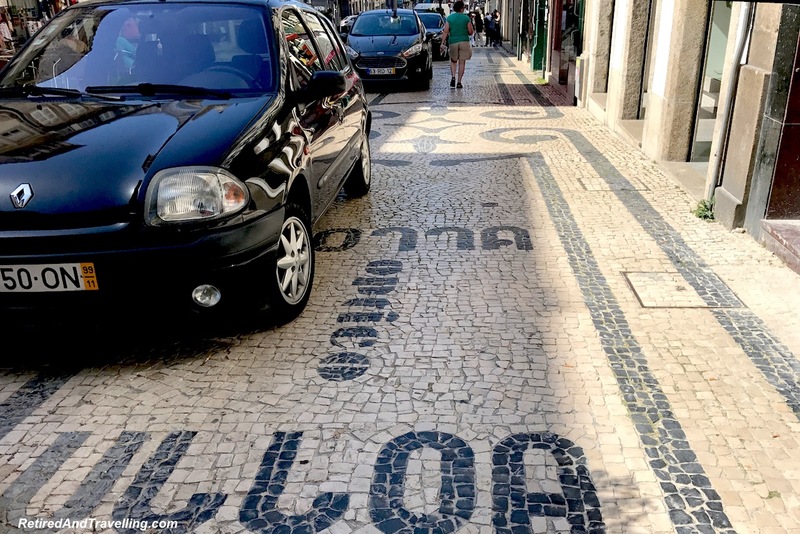 Our 4 weeks in Portugal started with a stay in Lisbon. 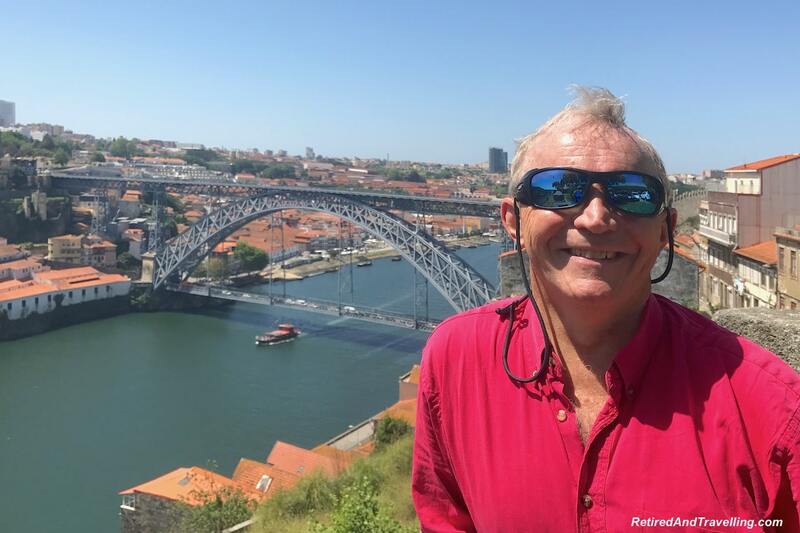 Then we explored the Algarve area and flew out to the Azores Islands. 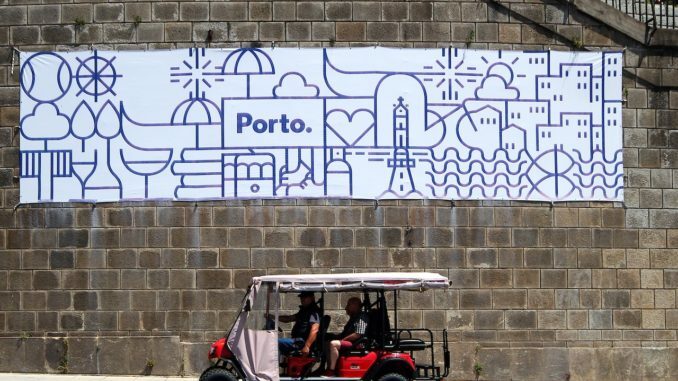 We landed next in Porto for 3 days. 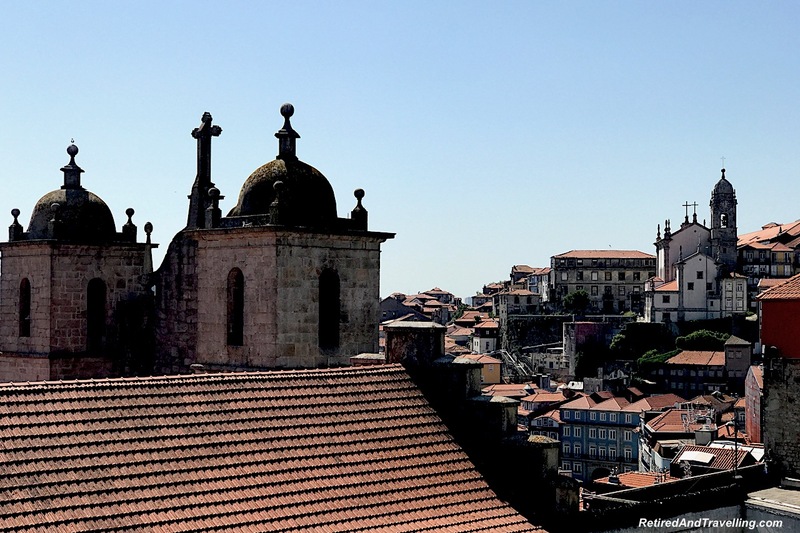 The historic centre of Porto was designated as a World Heritage site in 1996. 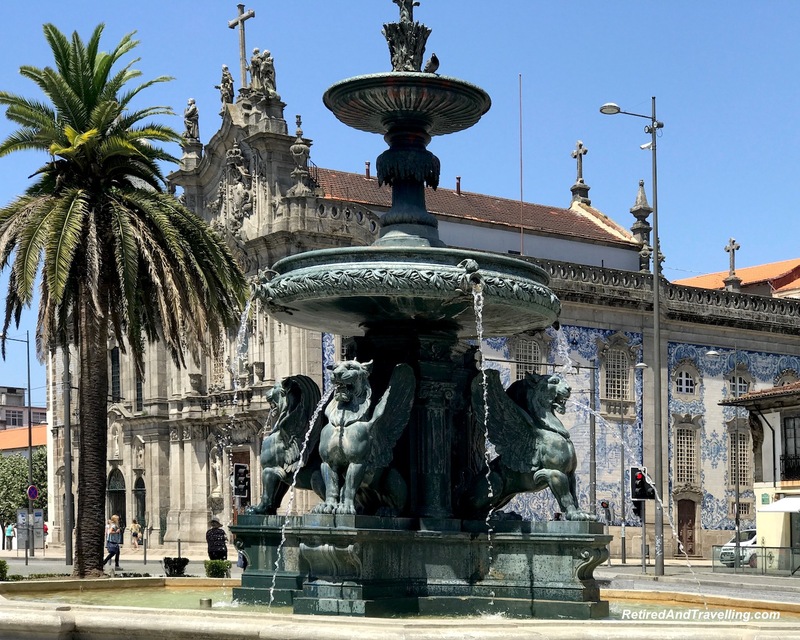 So it was easy to wander and visit the many things to do in Porto. 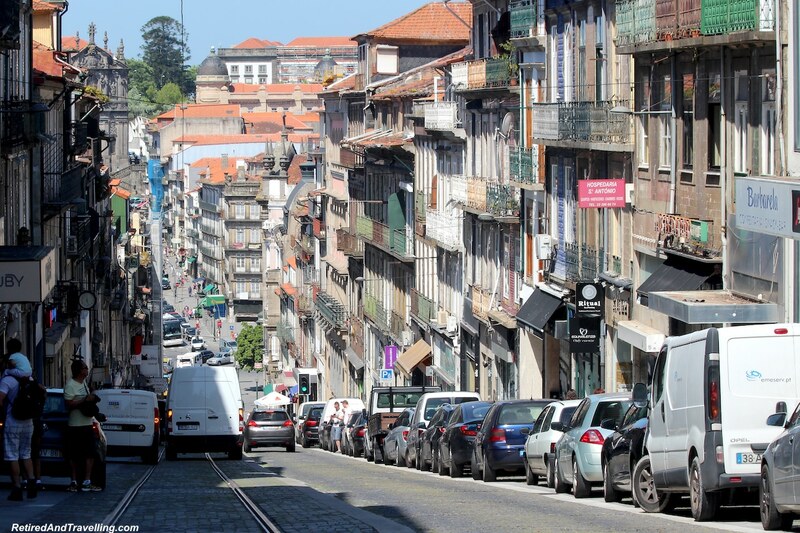 We walked in Porto, mostly downhill. Our hotel was uphill from the main waterfront so we could roll downhill from there. But once we got down, we did need to get back up. One day we came back by subway and one day we just dropped exhausted into a cab. 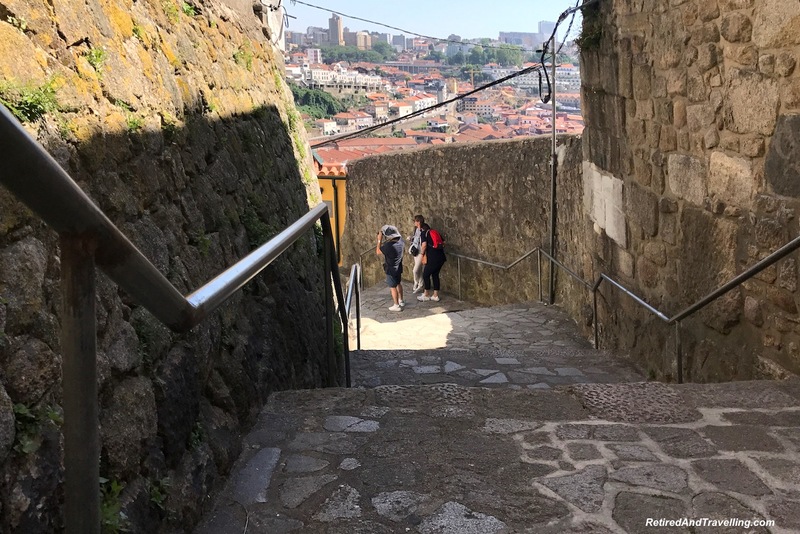 While we explored Porto, we did find some ways to avoid the walk up and down the steeper hills. 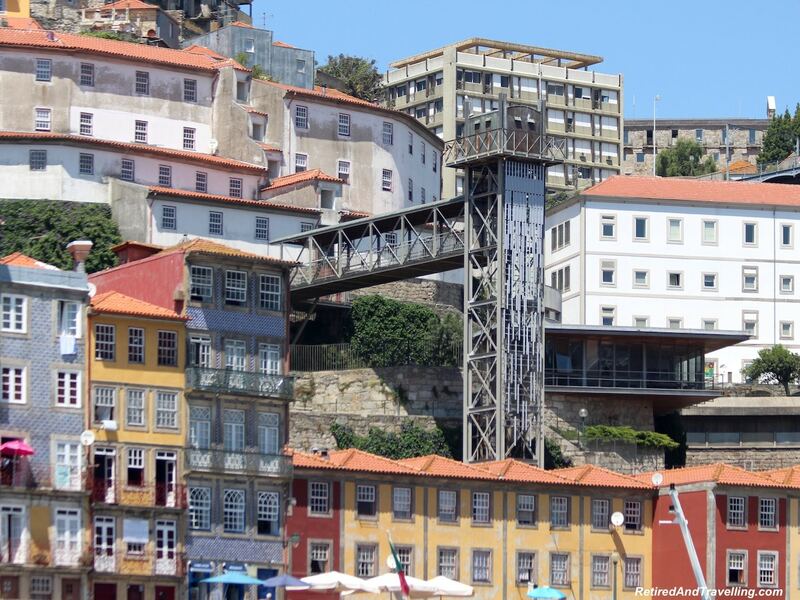 There was a funicular by the Muralha Ferdandina Fort. 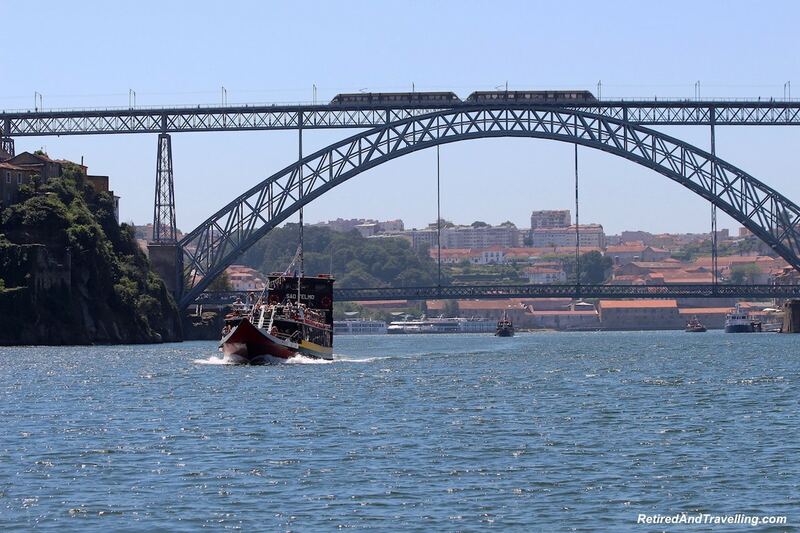 It took us down to the riverfront when we were off to cruise the Duoro River and see the 6 bridges of Porto. When we finished our river bridge cruise, we found an elevator that we thought would take us up to the Se Cathedral. When we exited the elevator we got a great view of the river. But there was still a long series of stairs to climb before we hit the top. 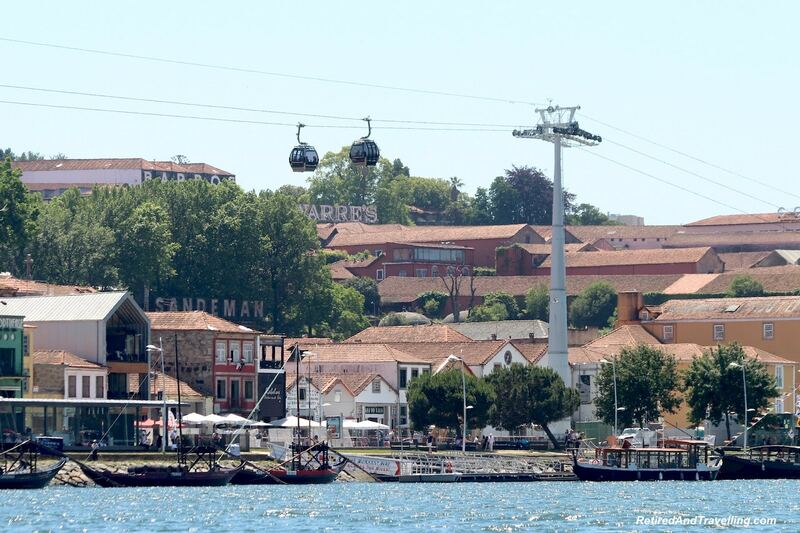 On the other bank of the Douro River there was the Teleferico de Gaia cable car. 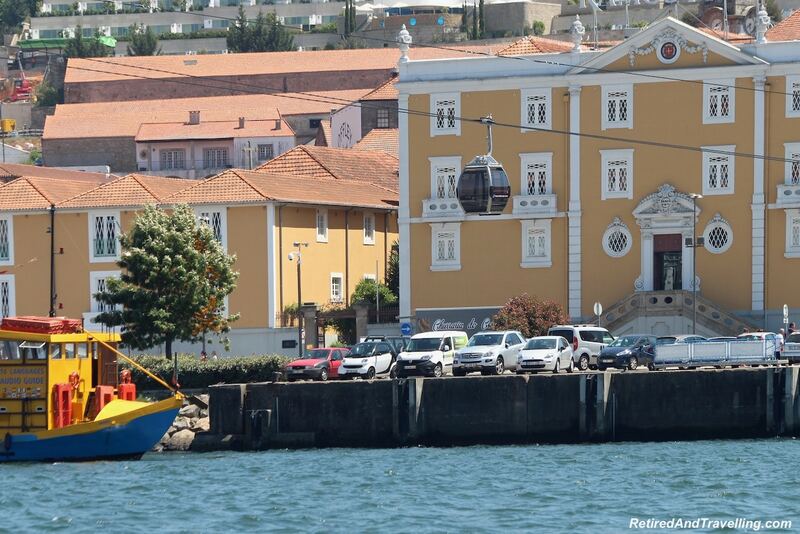 The cable car connected the Gaia riverside promenade to the upper deck of the D. Luis I bridge near the Monastery Da Serra Do Pilar. 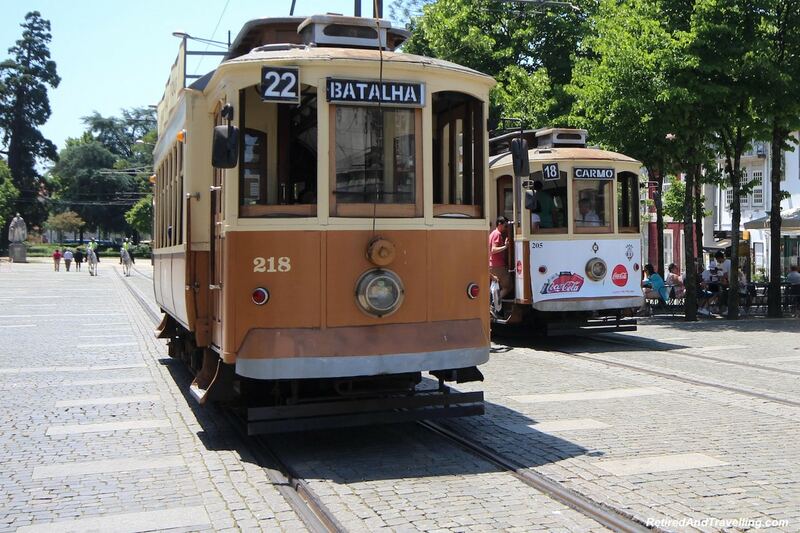 No matter what mode of transport you use to explore, there are lots of things to do in Porto. Unlike many other cities we visited for the first time, we decided not to use the Hop-On-Hop-Off bus. 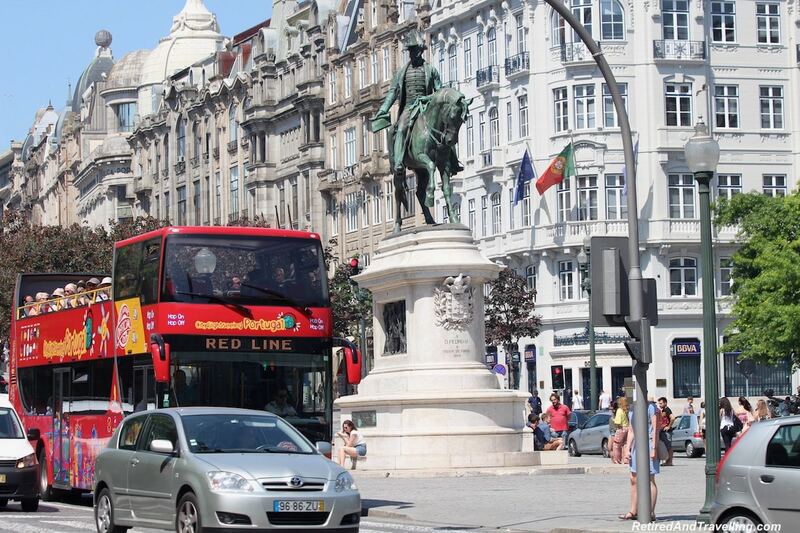 But there were a number of bus tours available to explore the many things to do in Porto. A small train and tuk tuks provided more personal tours. 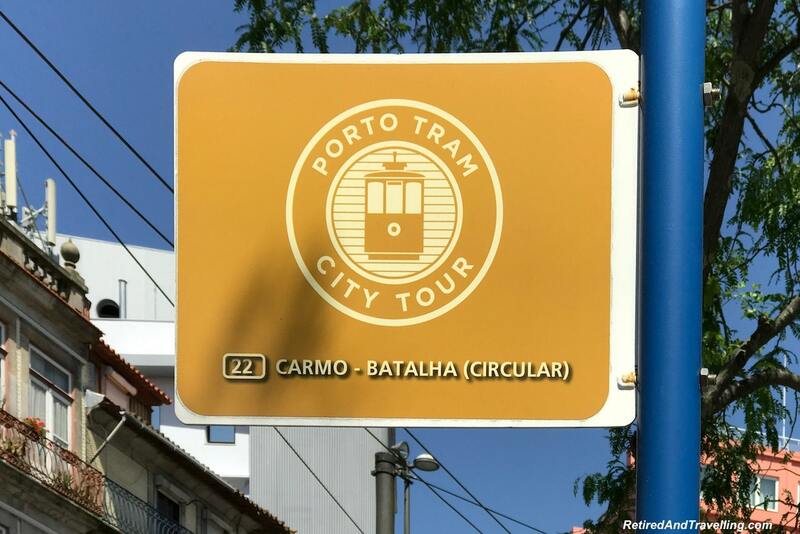 There was also a small tram that takes you from the Batalha Santa Catarina stop to the other side at the Carmo stop. 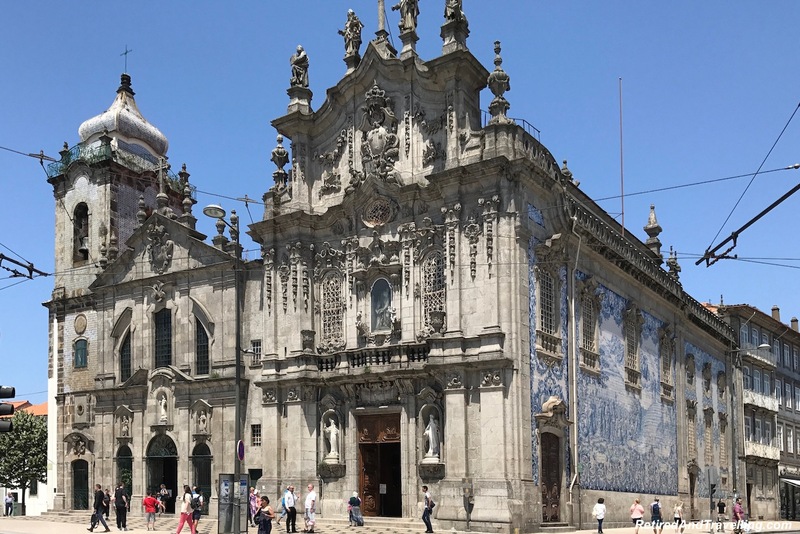 We walked for most of our 3 days in Porto. Everywhere we went there was art and beauty. 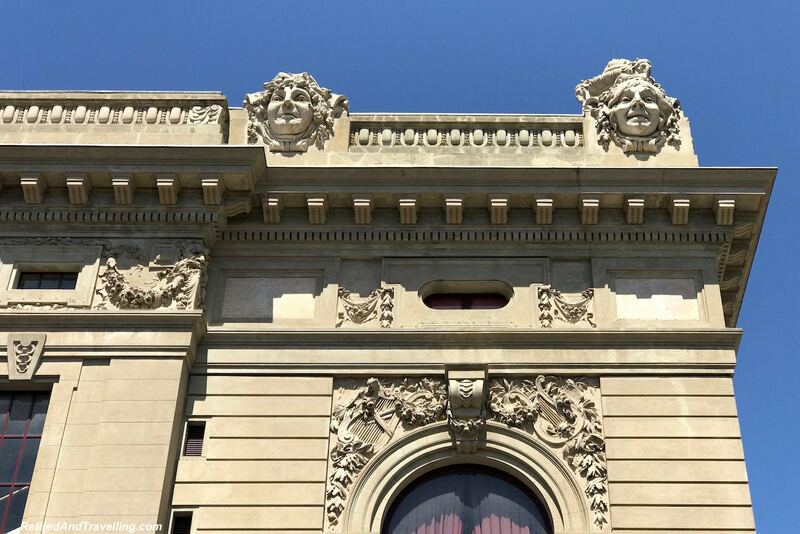 Buildings were intricately decorated. Statues were everywhere. 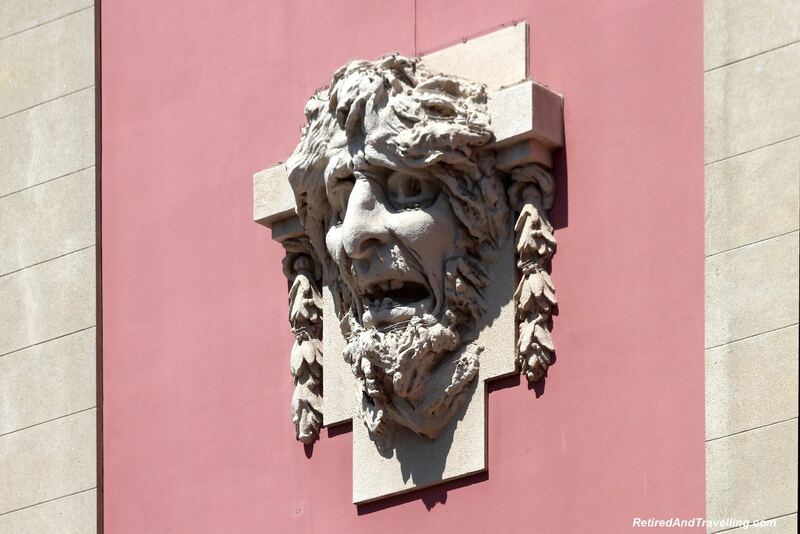 Interesting stone faces peered down at you. There were squares with statues and benches under the trees. 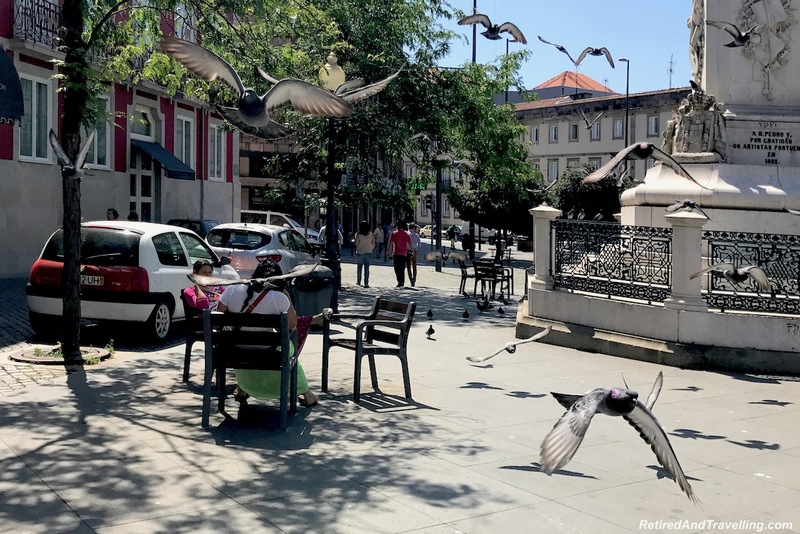 You could even enjoy your own pigeon swarm. 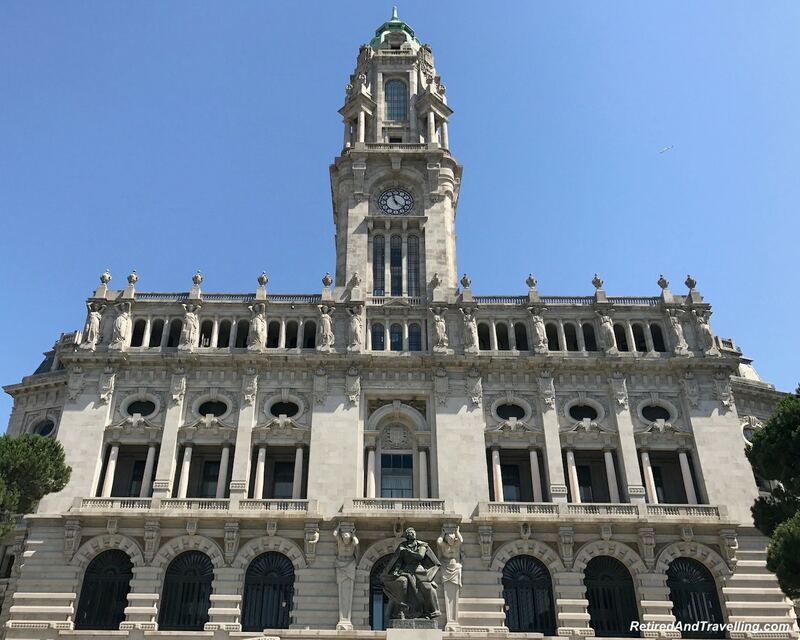 The Camara Municipal do Porto building with its tall clock tower could be seen from many points around Porto. 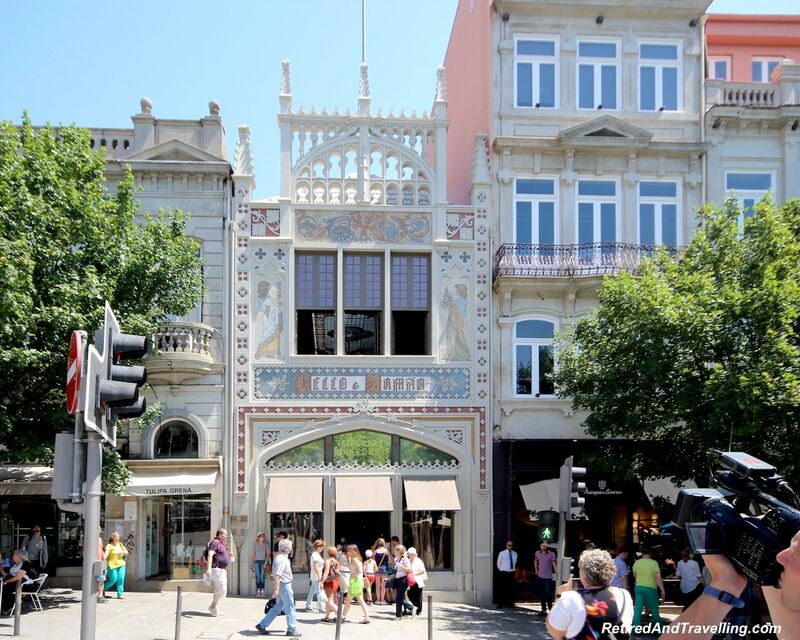 Liberdade Square provided a great view of some of the interesting architecture of Porto. 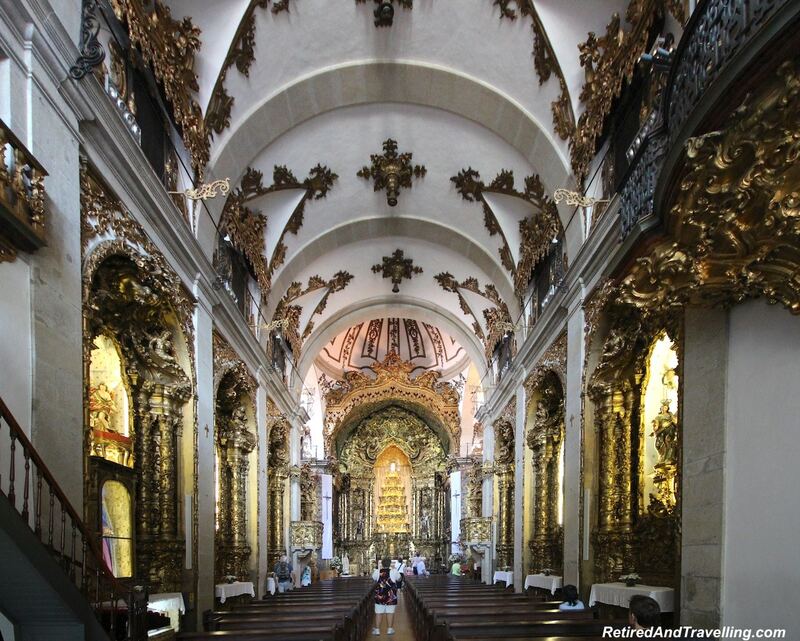 Everywhere we walked there were beautiful churches to explore – inside and outside. 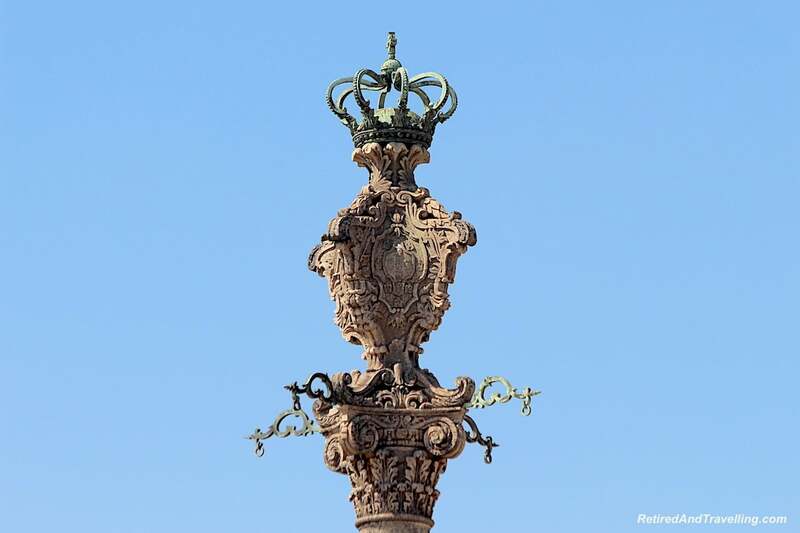 This is one of the many things to do in Porto that you must see for yourself! Some of the churches were small local churches. 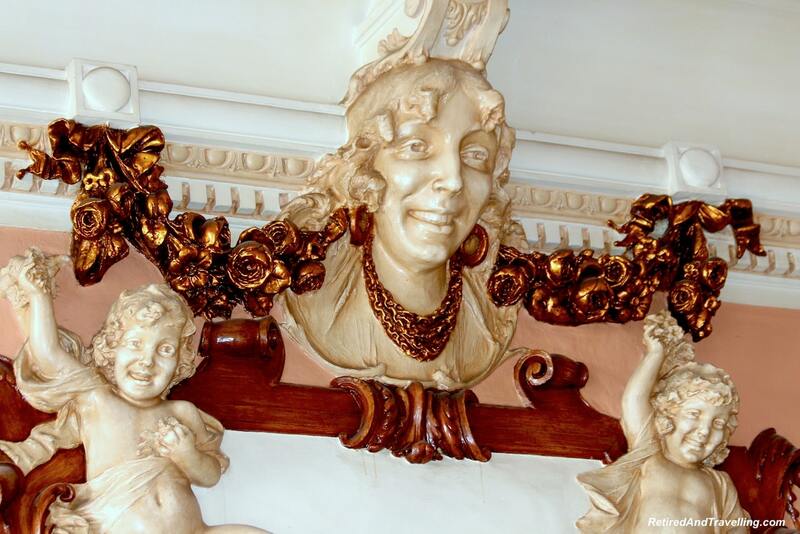 These were typically less ornate. Some churches offered surprises. 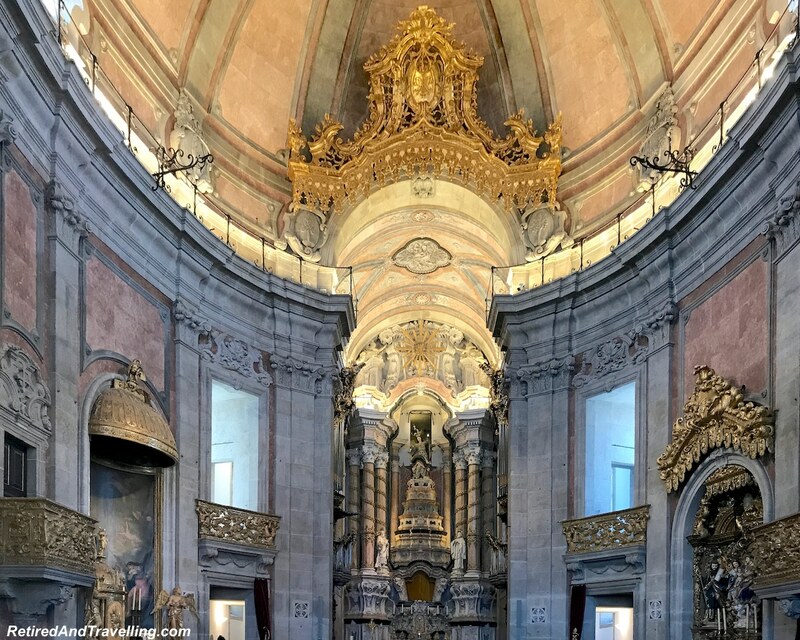 Close to our hotel was the Igreja da Santissma Trindade. The very stark exterior had minimal decoration. 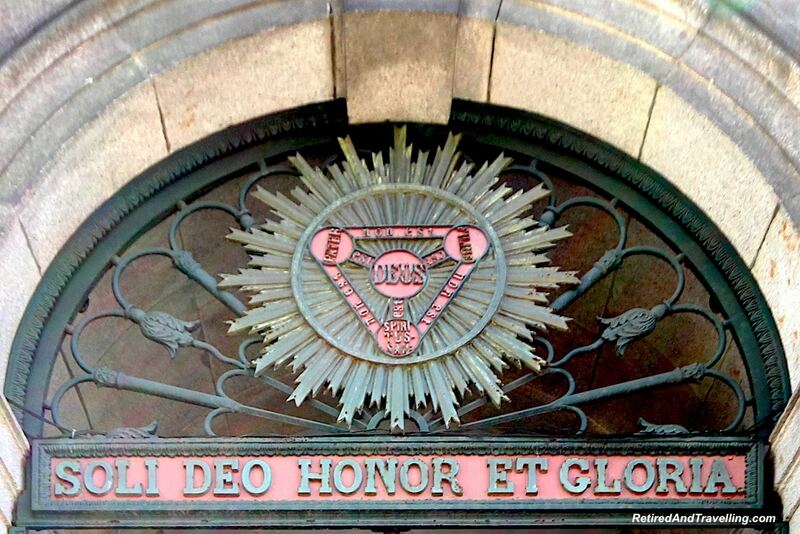 But inside we found more elaborate decoration. 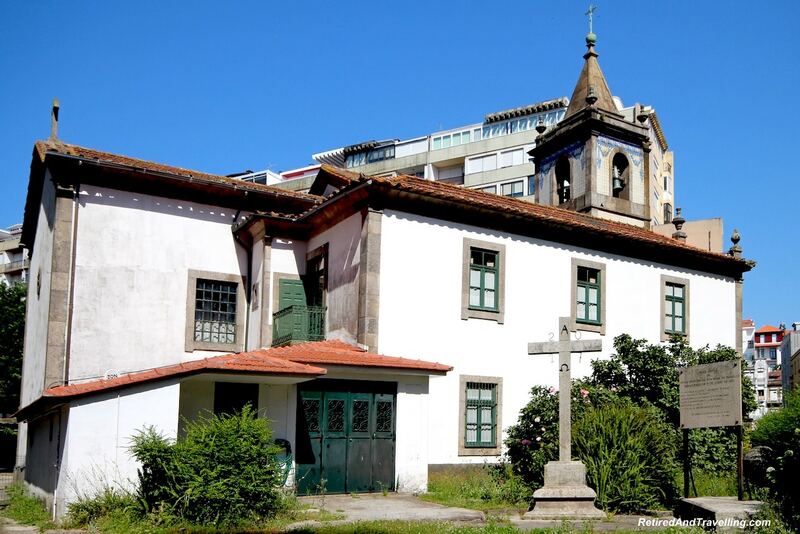 On our trip down the walking strassa on Santa Catarina we saw two churches (Capela das Almas de Santa Catarina and the Church of Iledefonso). 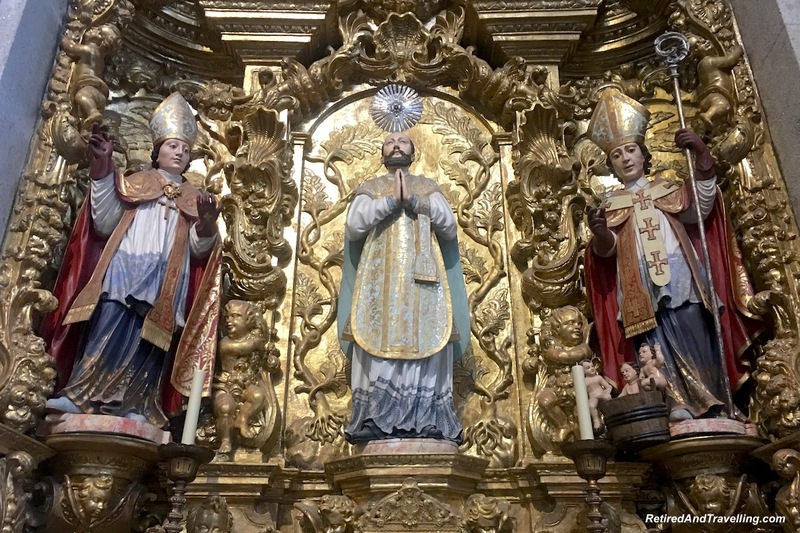 The Igreja de San Antonio was close to the train station. 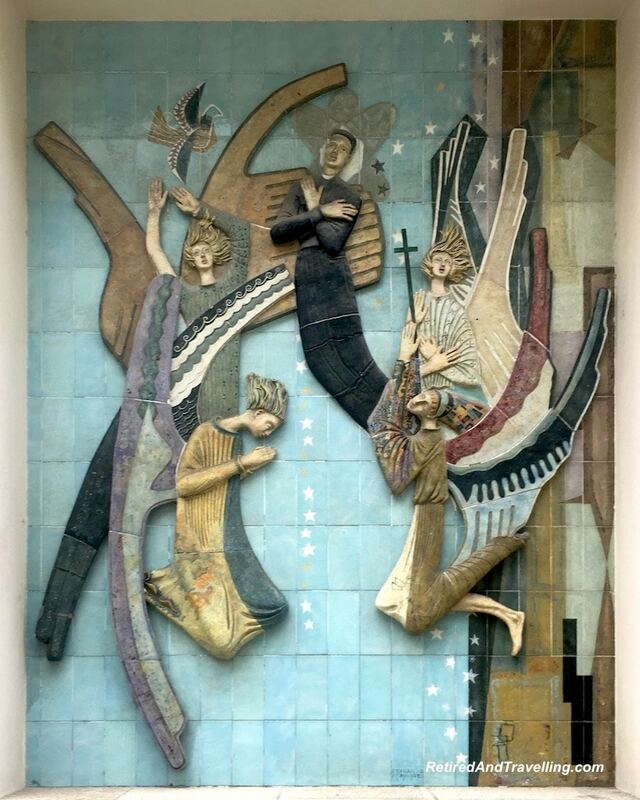 All were beautiful works of art on the outside, fully decorated in tile work. 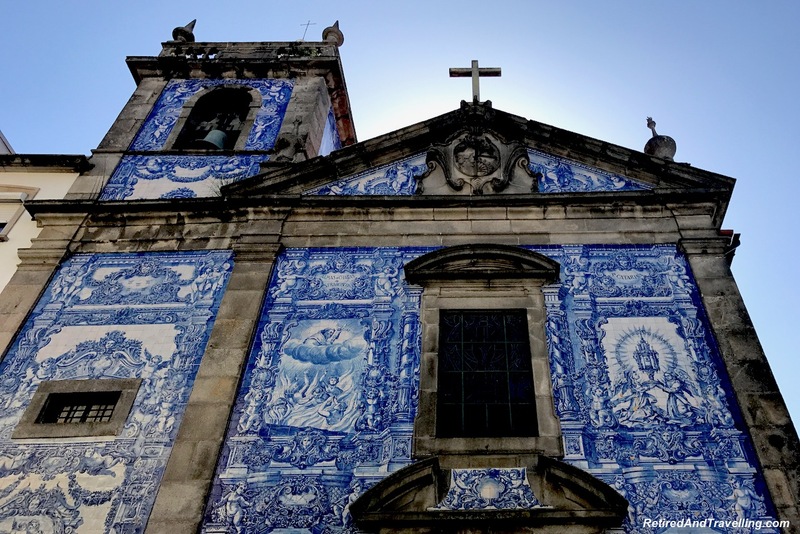 The pair of churches joined together (Igreja do Carmo and Carmelitas) were interesting from the outside with their tile work. 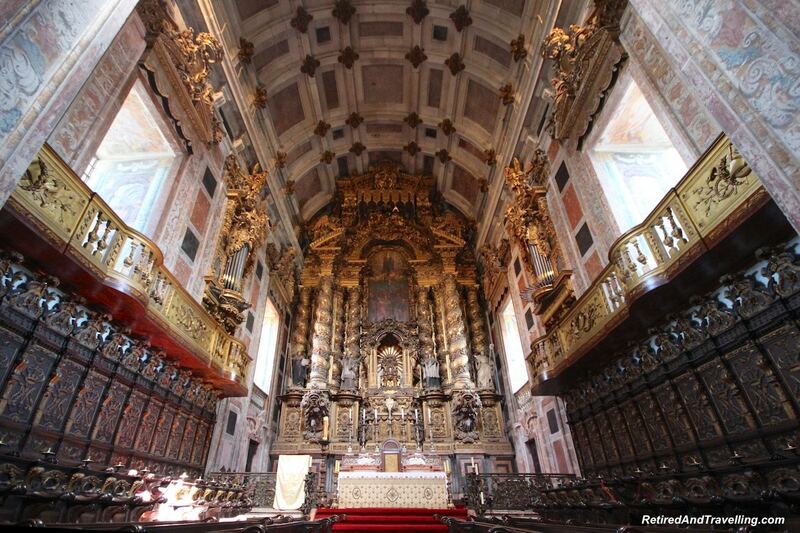 But inside the churches sparkled with gilt and colour. 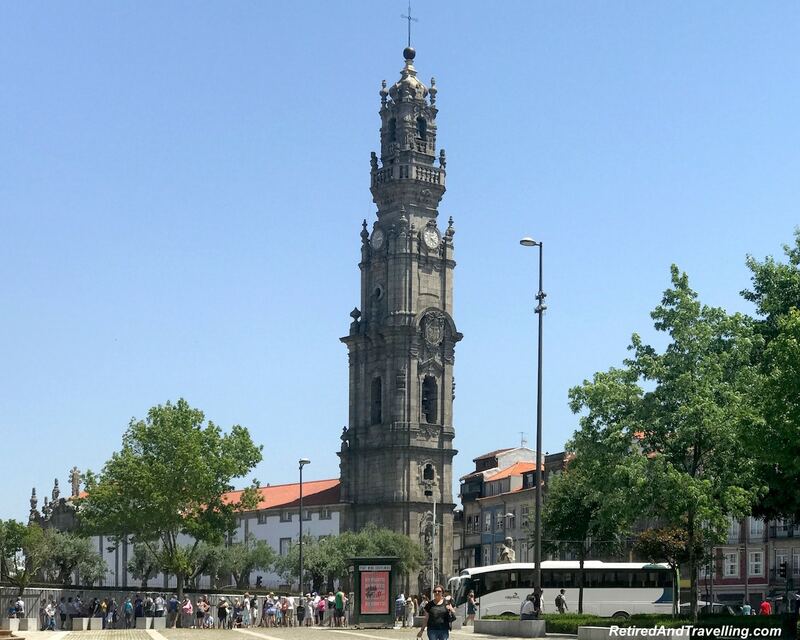 We headed to the Clerigos Church intent on climbing the 240 steps of the tower for a panoramic view of Porto. It was late in the day and we did not have the energy left for the climb. We took brief respite in the church and admired this beautiful church. 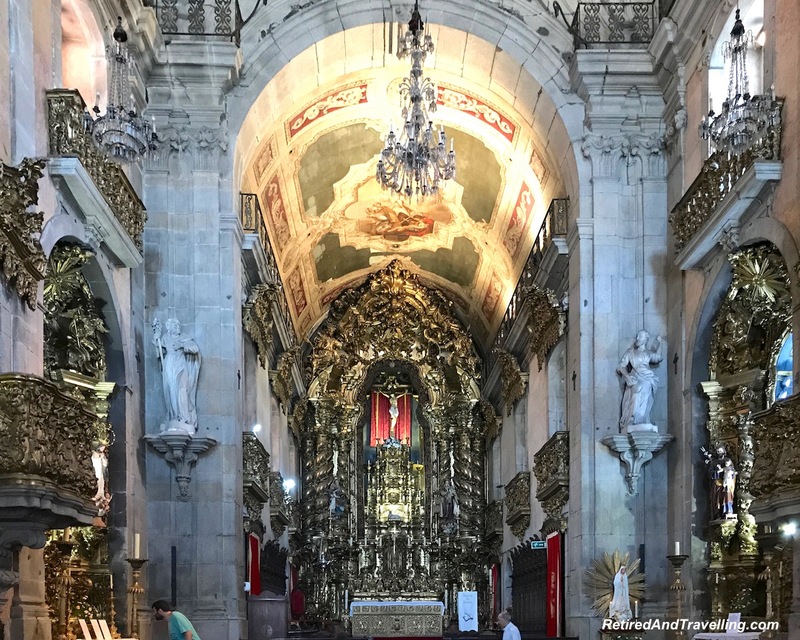 The final church we visited was the Sé Cathedral. From the riverfront, we headed up to see the Se Cathedral standing high above the river. 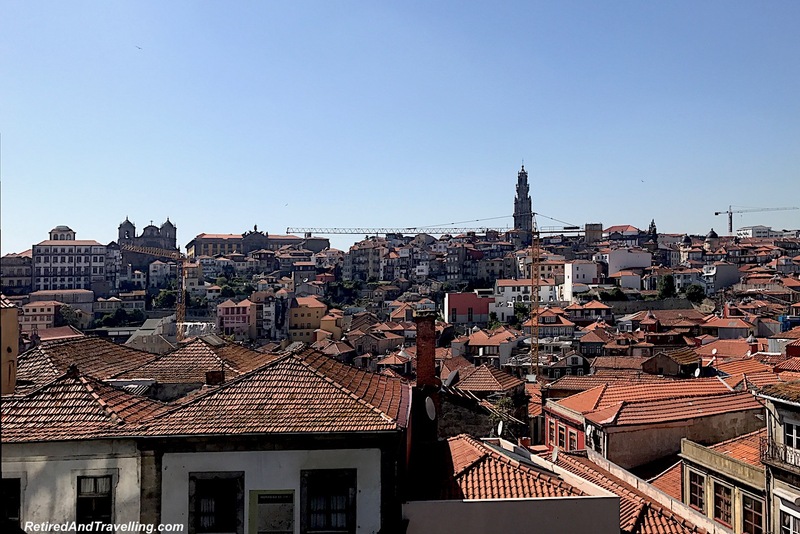 From this vantage point in Porto, we could look our over the city. In all directions we saw more church towers. The square was quiet for a few minutes between tour groups and we were able to admire the statue in the courtyard. 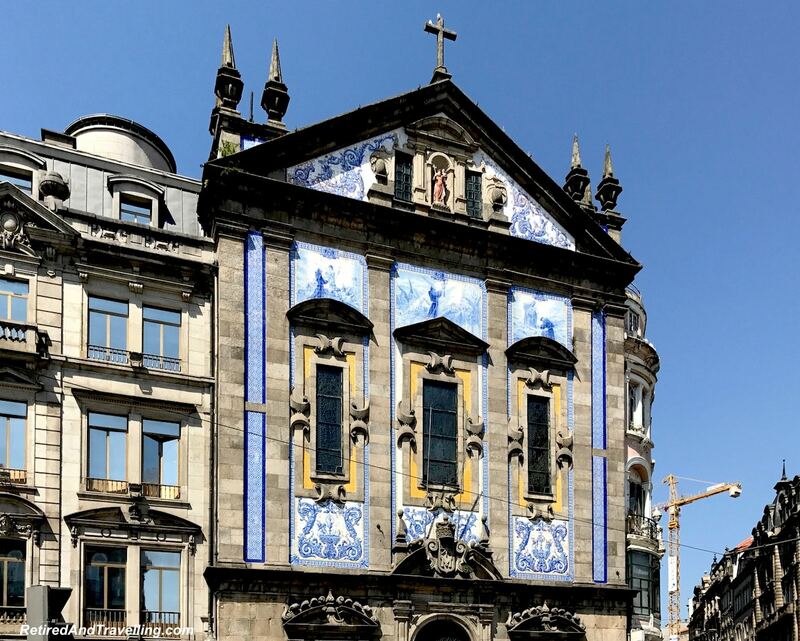 The church was another massive gothic style church with minimal decoration on the outside. The inside was a cool and quiet retreat at the end of a long day. 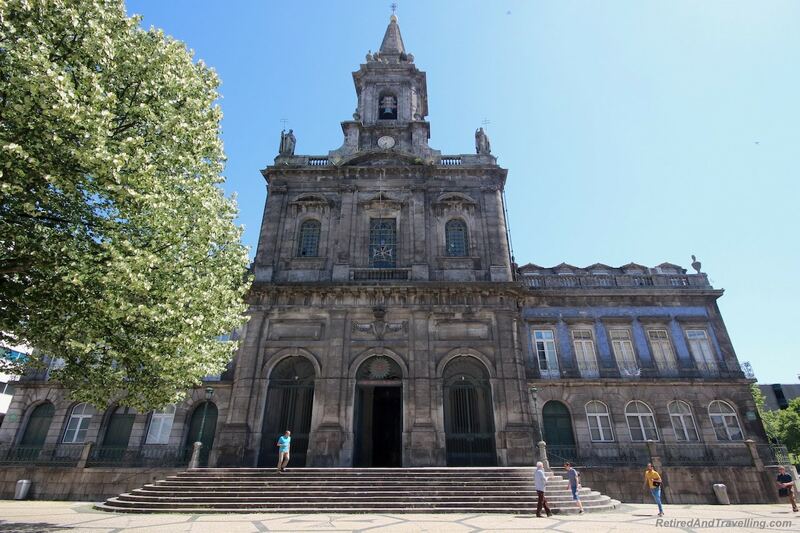 The stunning churches are one of the highlights to the things to do in Porto! 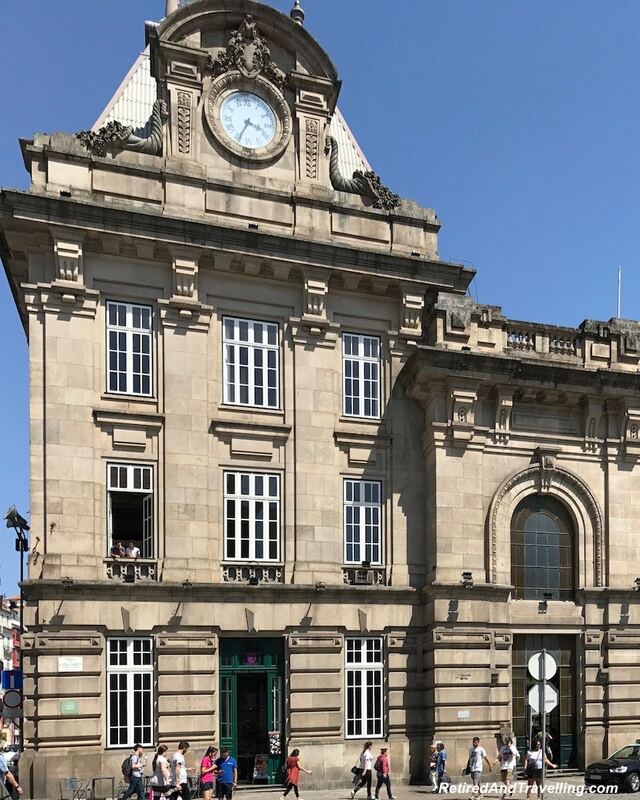 Whether you travel by train or not, no trip to Porto is complete without a stop at the Sao Bento train station. 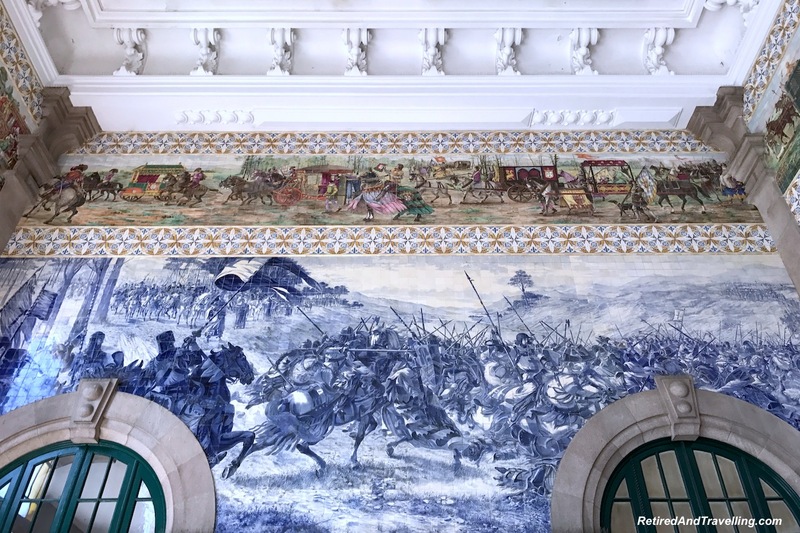 The inside walls of the train station were decorated in tiles. 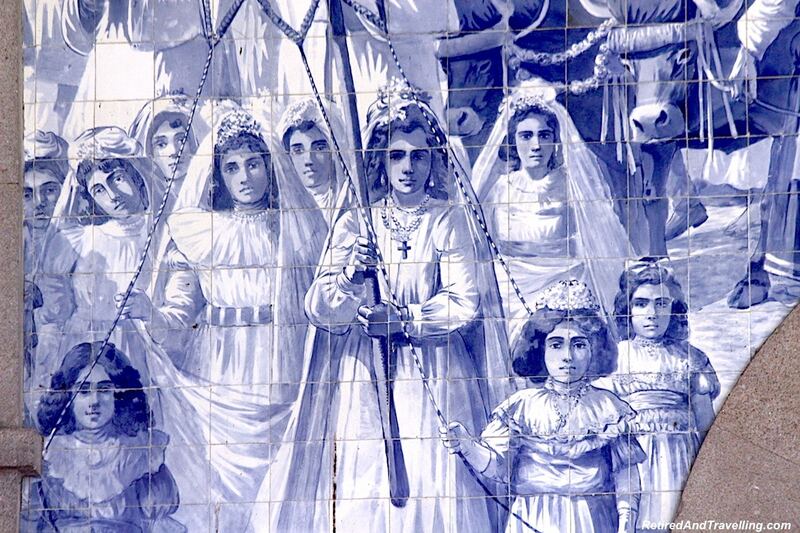 The tiles tell many stories about life in Portugal. 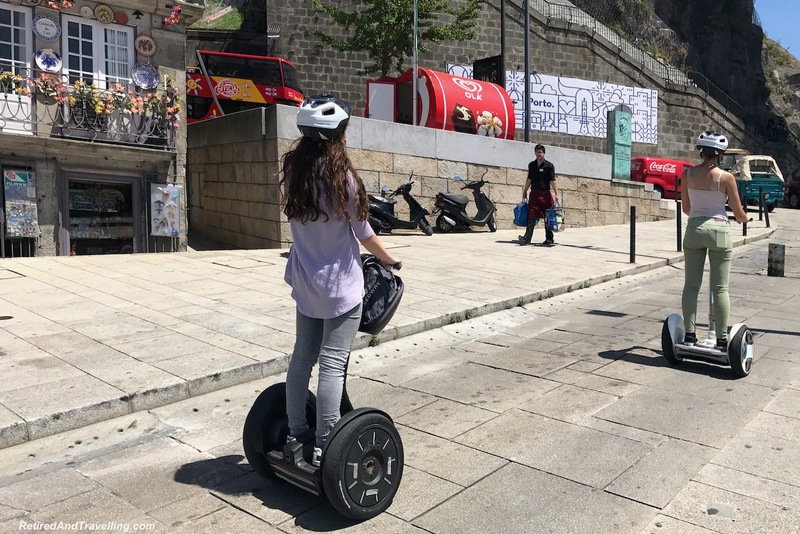 This is one of the things to do in Porto that may not seem obvious but don’t miss a chance to see this! 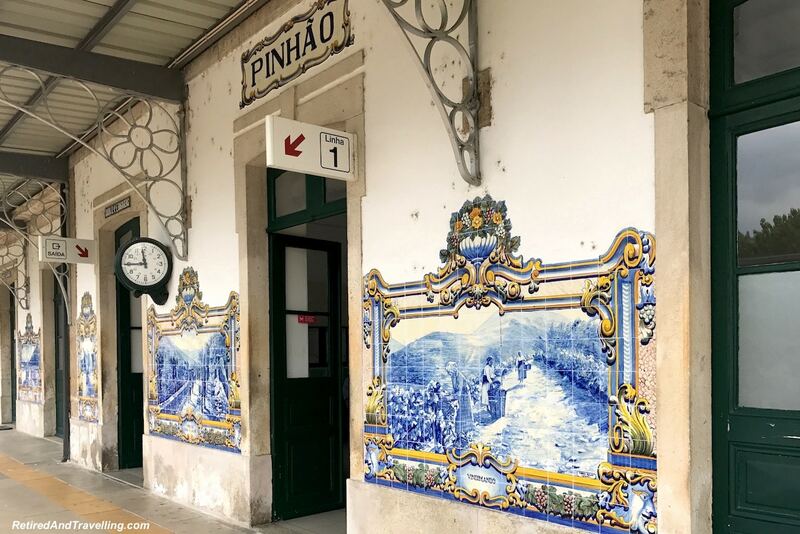 We were so intrigued by the tile work in a train station that we made a point to stop in the train station in Pinhao. 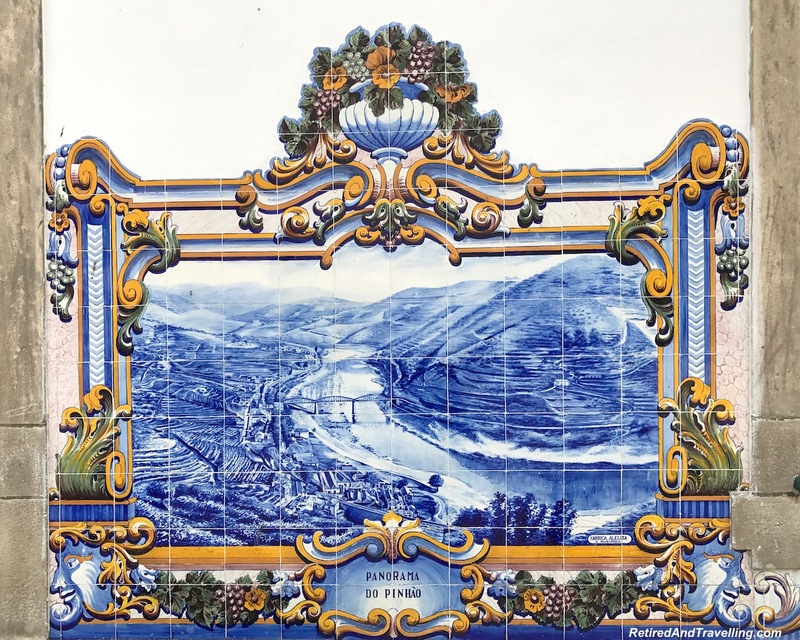 The outside walls of that train station showed a series of tile murals depicting live in the Douro River Valley. 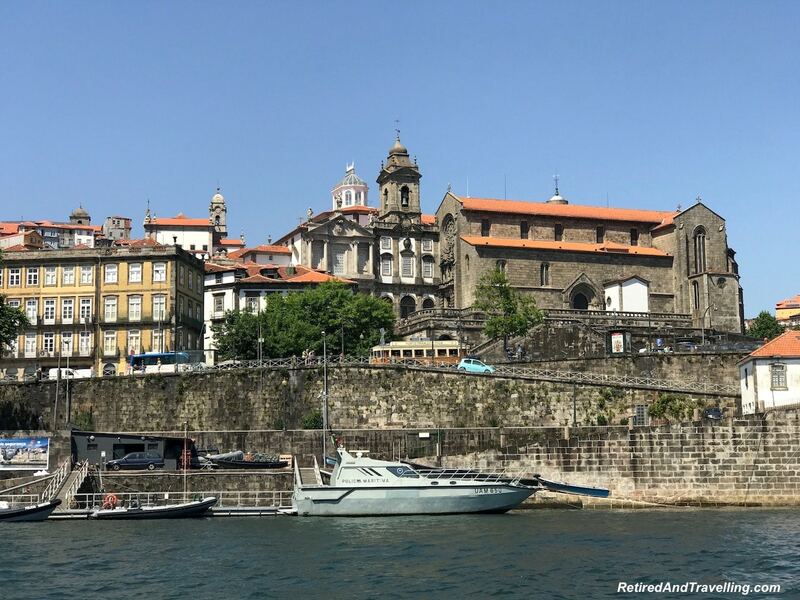 As we headed down and down the hills of Porto, we finally hit the riverfront area along the Douro River. 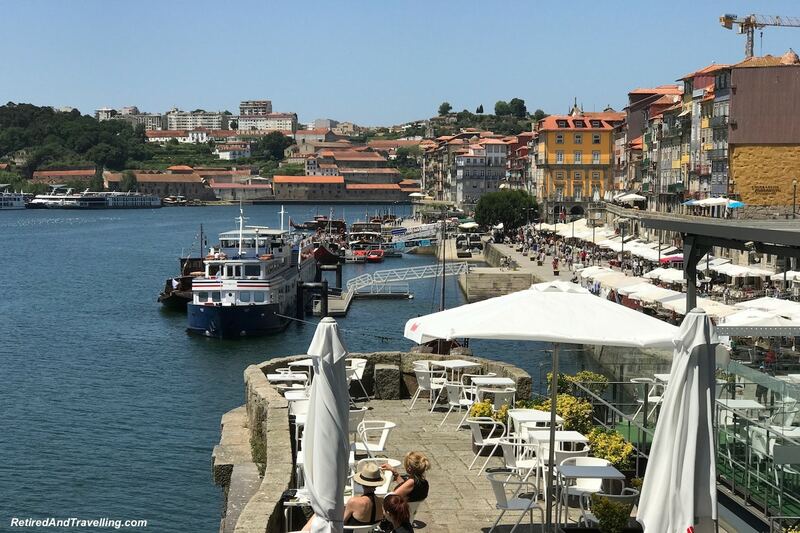 The riverfront is often on the top of the things to do in Porto! There were boats of all kinds in the harbour. Water taxis were available to get across the river. Souvenirs were sold on the dock and people sat for portraits. All along the waterfront we found small cafés and restaurants. You could pay a little more to get a seat in a spot by the water. We chose to head back into one of the alleys and got a great lunch without the tourist price. While we passed on the more touristy places for lunch, I could not resist stopping at Peter’s Cafe for a gin and tonic. 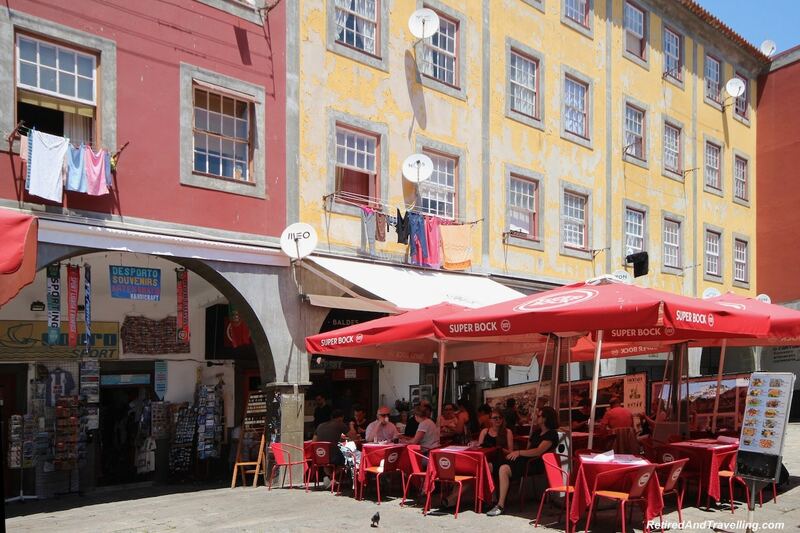 We enjoyed Peter’s Cafe when we were staying on Faial Island in the Azores. The house brand gin was very reasonably priced. I found their gin and tonics to be a great way to cool down after we walked the riverfront. You can take a river taxi to get across to the other side of the river. On the other side you will find a large number of port cellars for your port tasting experience. 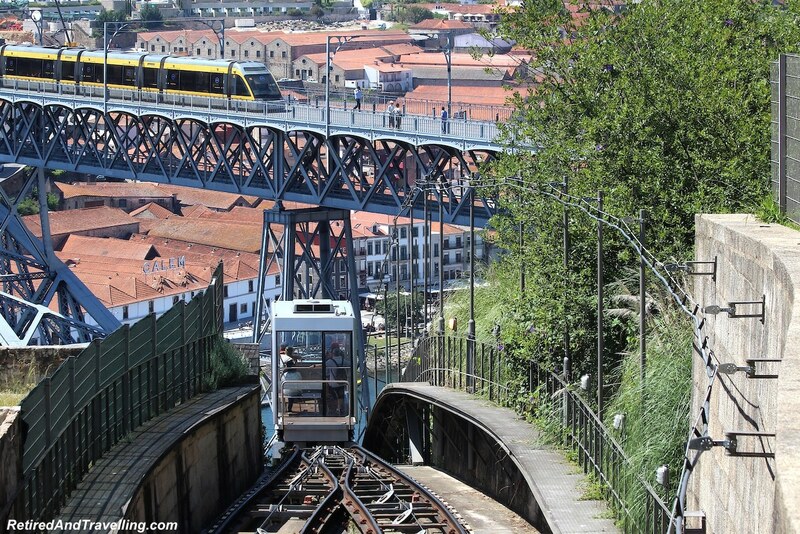 Once on that side you could take the cable car for a panoramic view. We started our tour of the Douro River from above. We could see the bridges in the distance and the river boats far below us. 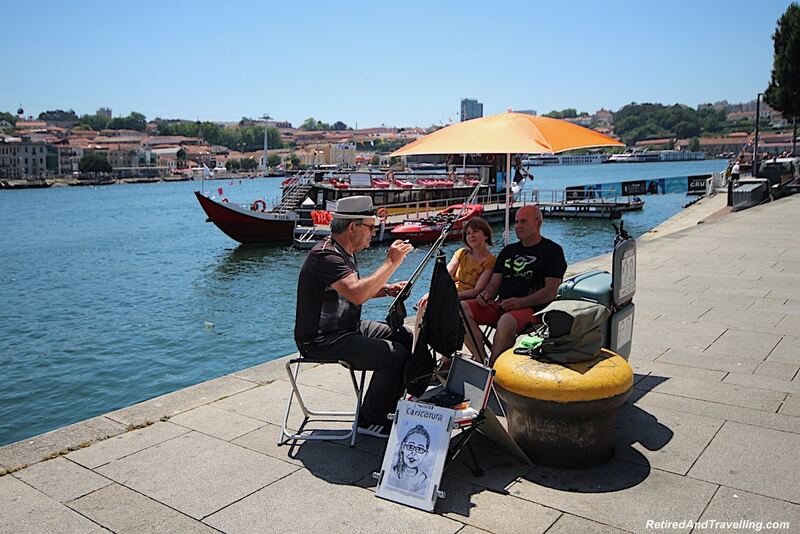 On the riverfront, we found a number of booths selling tickets for a Douro River six bridges tour. 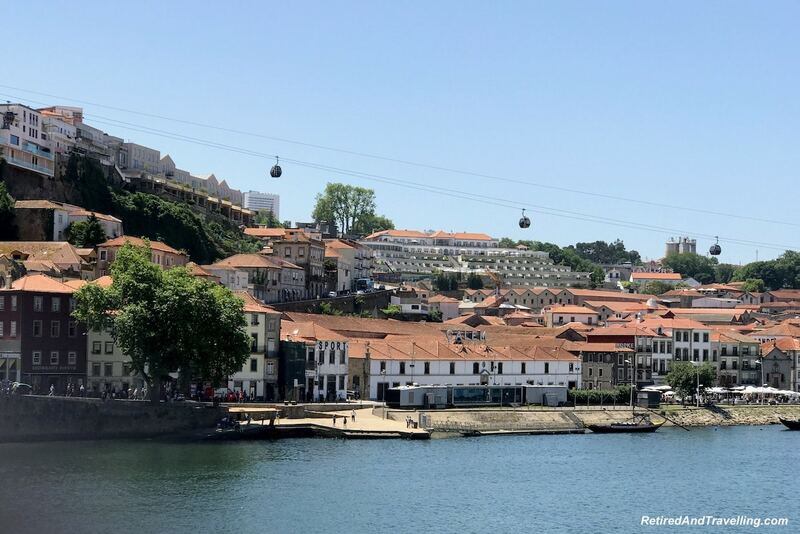 We enjoyed a trip along the Douro River in Porto. 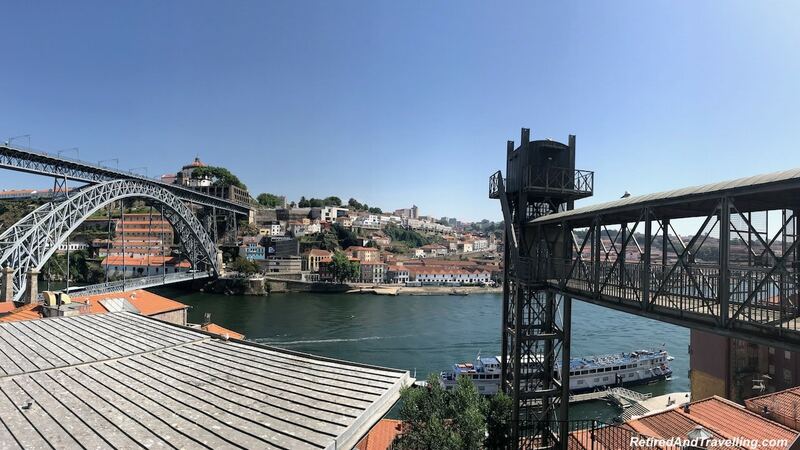 We saw the six bridges high above us that cross the Douro in Porto. 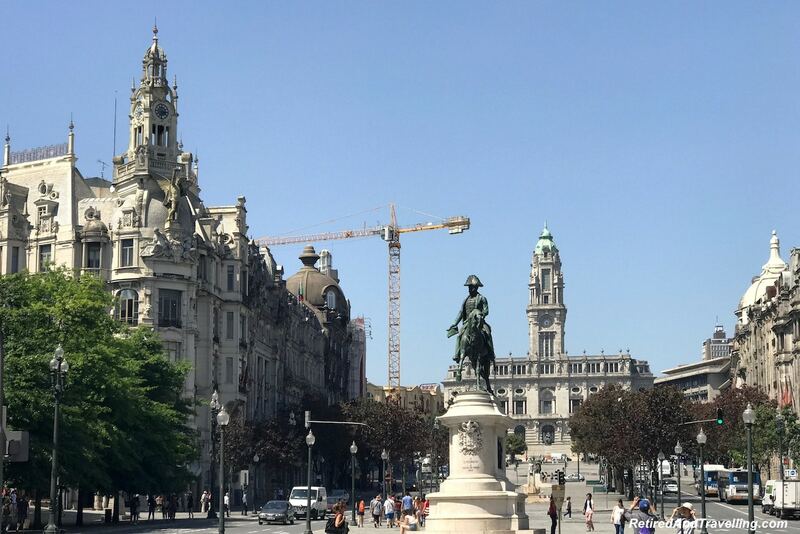 It was a good way to get a view of many of the other things to do in Porto. 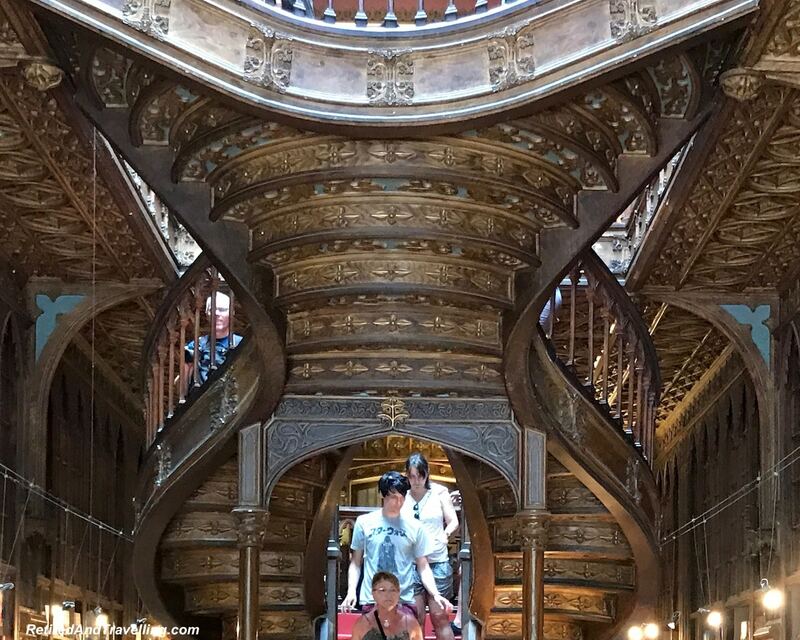 It is said that the staircase in the Livraria Lello and Irmão was the inspiration for the magic staircase in the Harry Potter books. 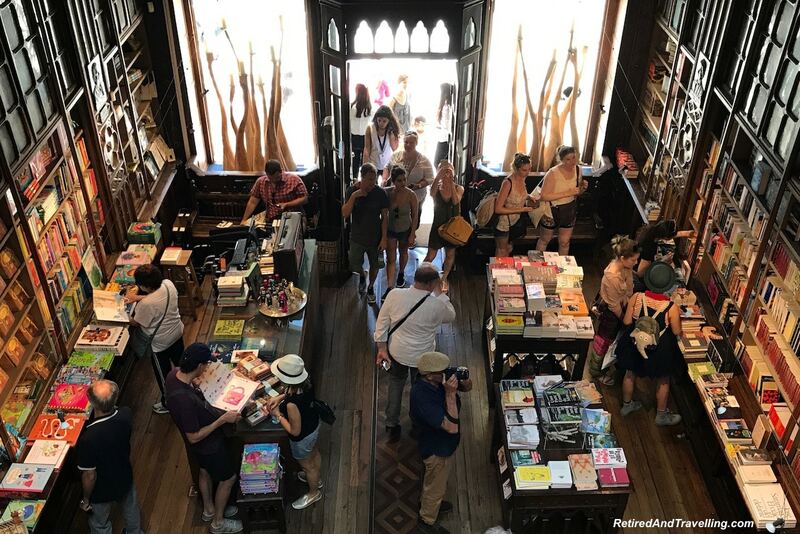 This has made the bookstore one of the things to do in Porto. The building from the outside was interesting. To get a tour I walked up the street a few buildings to the ticket office. I got a ticket and waited for my number to be called. 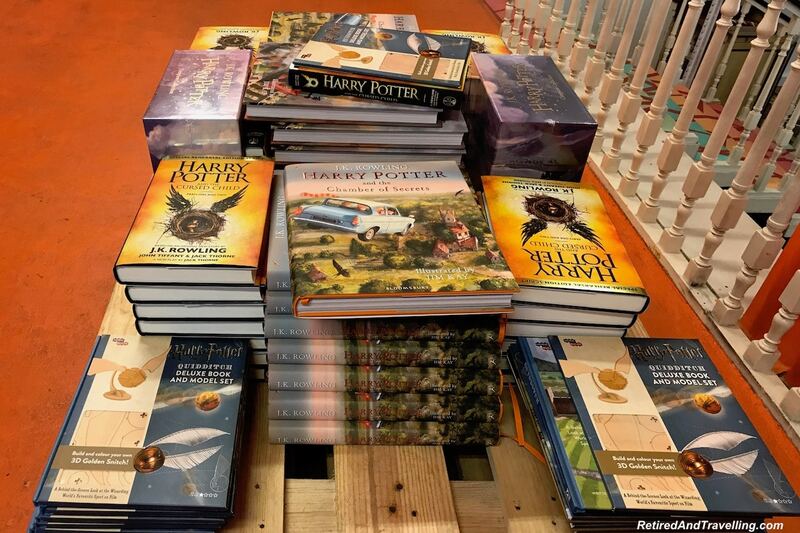 When I entered, the path led me through a large area with Harry Potter displays and books for sale. I was then back on the street and had to walk around the corner to the bookstore entrance to get in. The shop was crowded with tourists all trying to capture a unique image. But in the small space, every photo had strangers in it. The staircase was an interesting spiral design. Most people came to see the staircase. 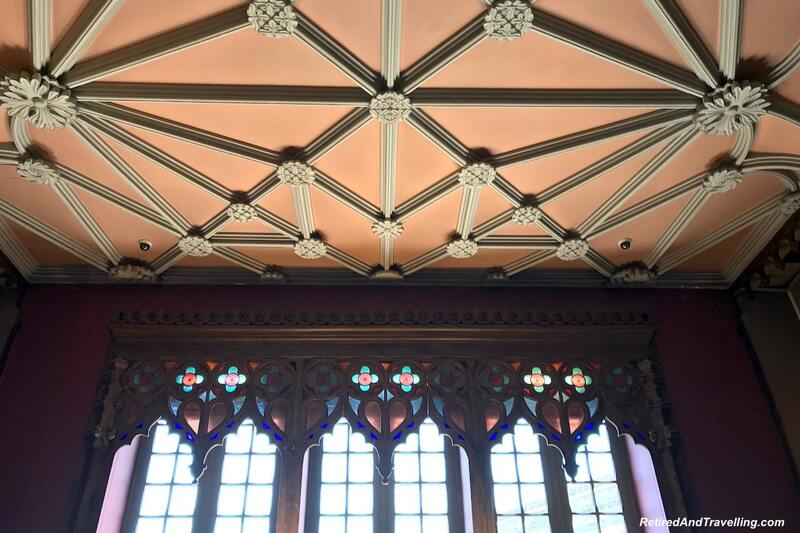 But the ceiling was one of the most interesting parts of the building for me. 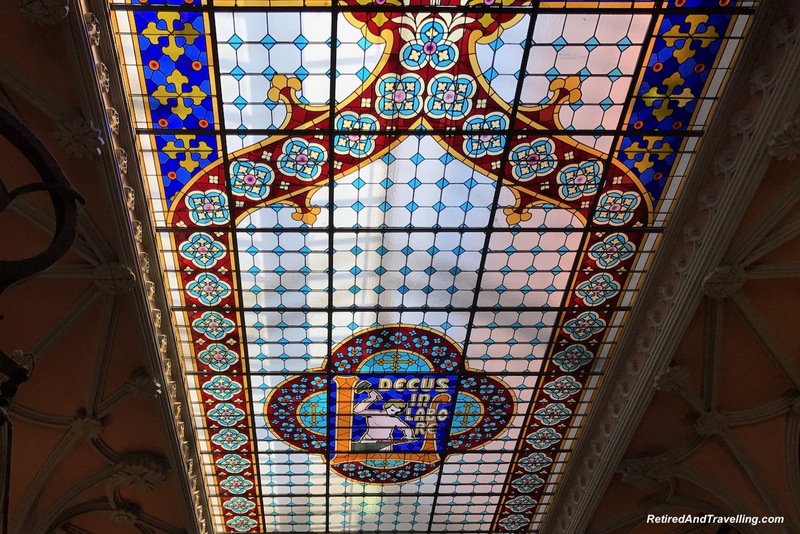 The highlight was a large stained glass window. 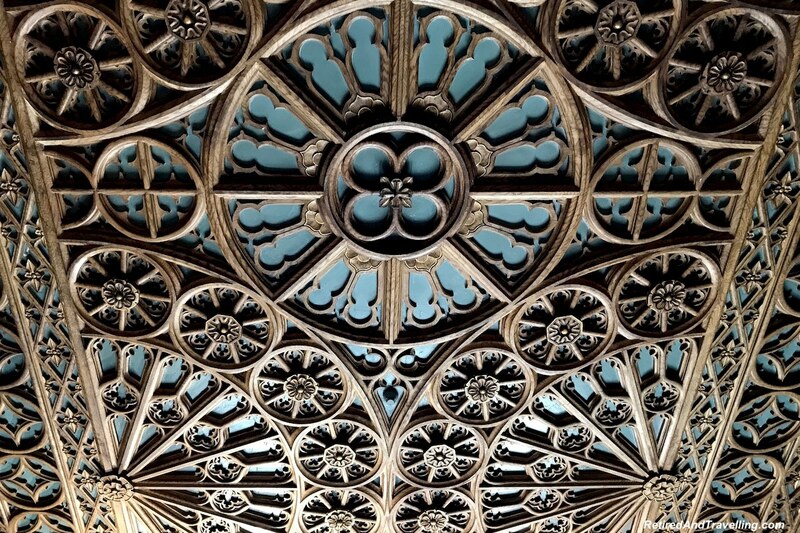 But other parts of the ceiling were equally intricate in design. Despite being a tourist attraction, it was indeed still a bookstore that looked very much like a large library. You could even see the track on the floor where the movable ladder ran. This provided access to the higher shelves. David passed on visiting this spot. He went off to wander in the area while I waited in line and then finally toured the library. David was more than happy to just see my pictures from inside. 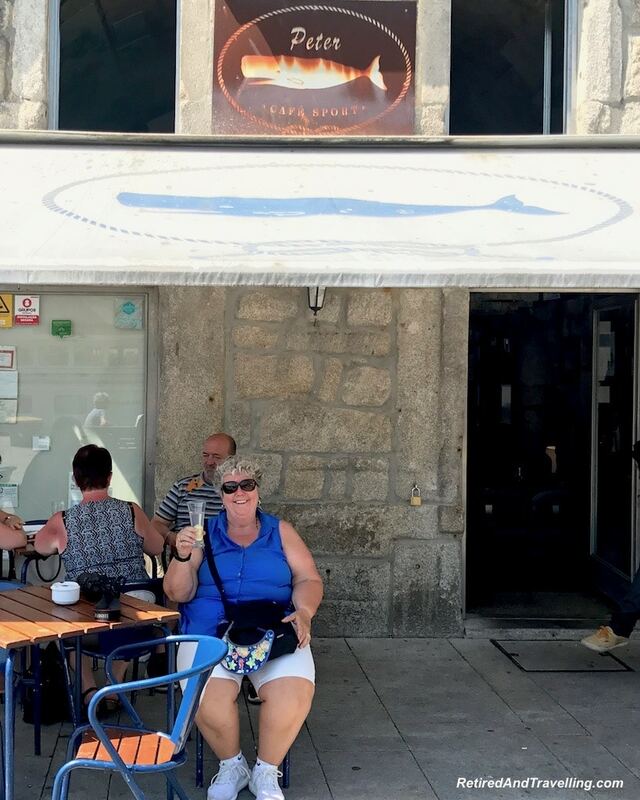 We had a lot of good food in Lisbon and Porto was no exception. 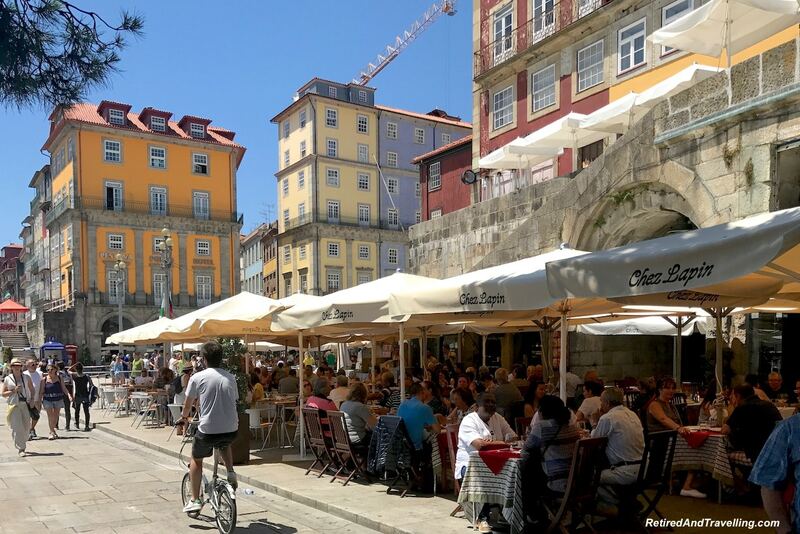 In Porto we specifically went in search of coffee, gelato and port. 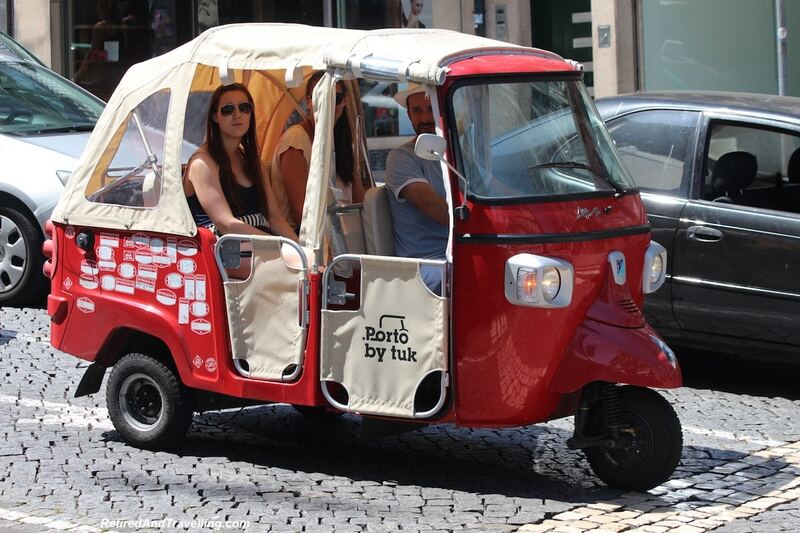 This was one of our favourite things to do in Porto! 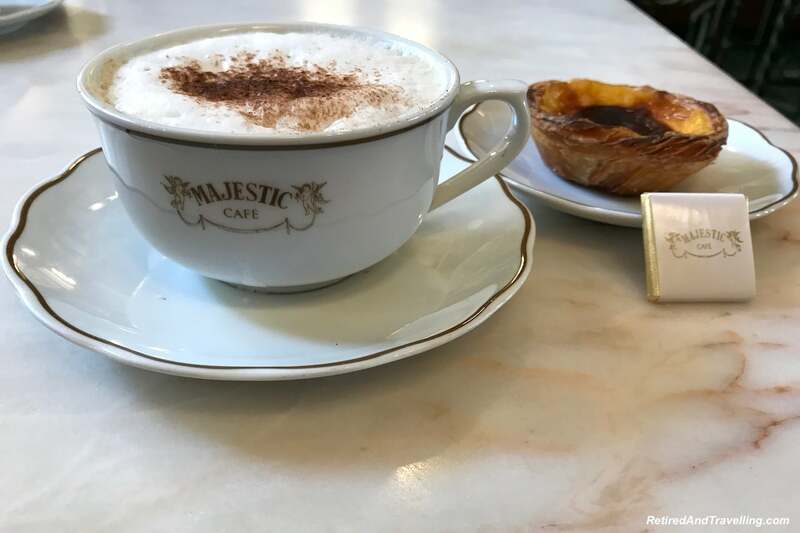 We found coffee shops that satisfied our coffee and tart desires. 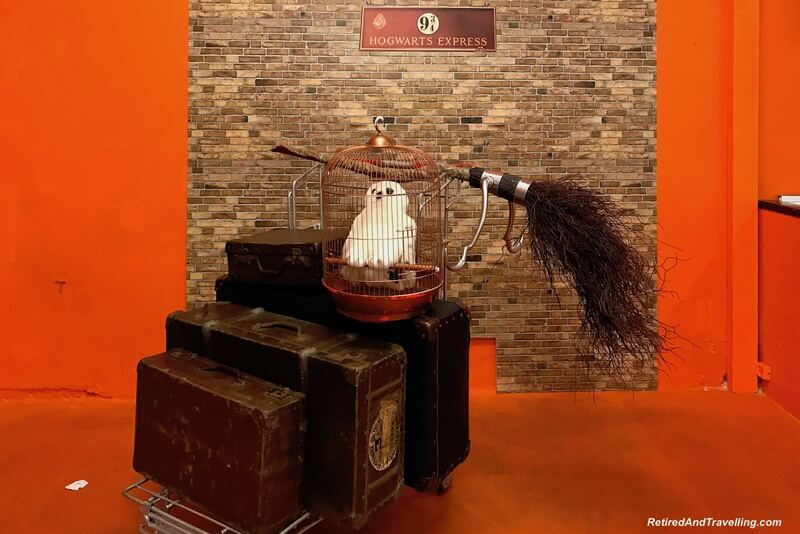 While at the same time they provided artistic delight in very different styles. In search of gelato, we also found what was labelled as “The Best Chocolate Tart”. 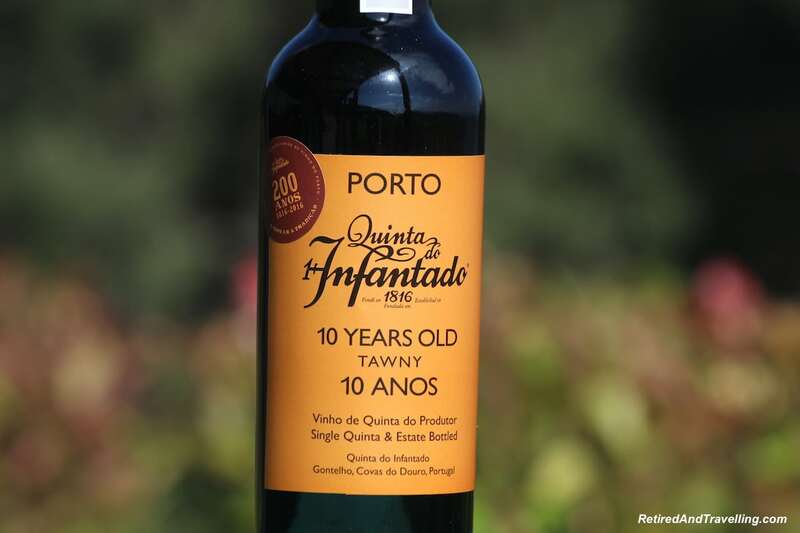 We got our first samplings of port wine and learned a little. 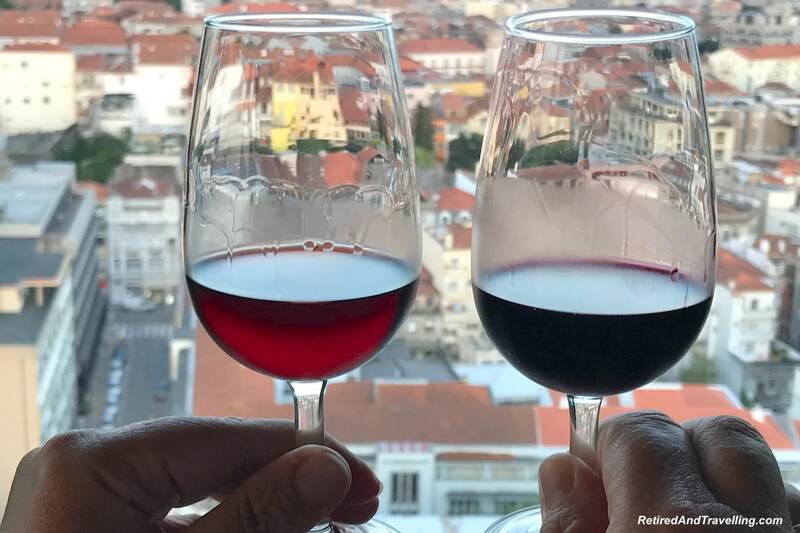 A tour of the wine cellars of Porto broadened our taste tests. Our education continued as we explored the vineyards of Douro River Valley. 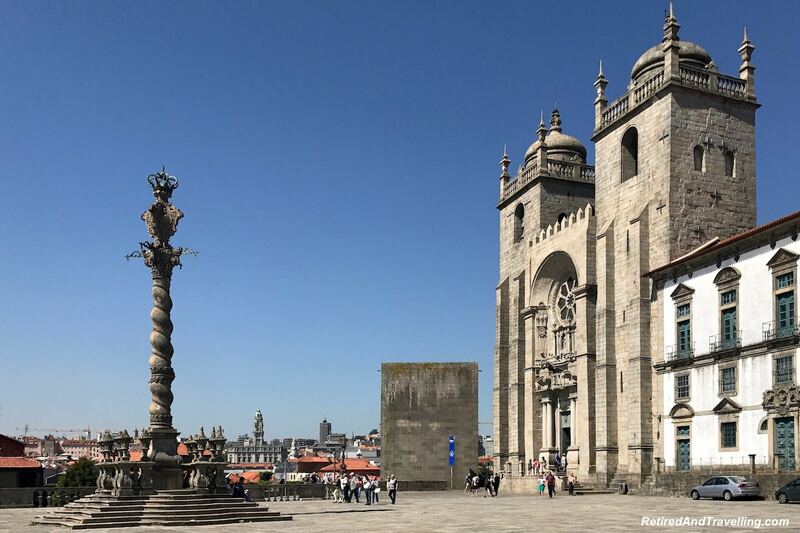 If you run out of things to do in Porto, you should also consider getting out of town. 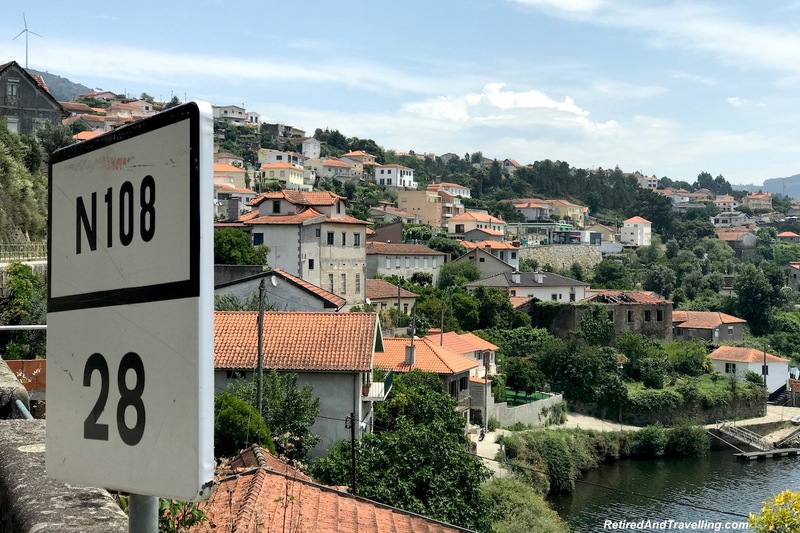 After we visited Porto, we picked up a rental car and headed up the Douro River Valley. We took the small road along the river for a day and got a great view of this scenic river valley. 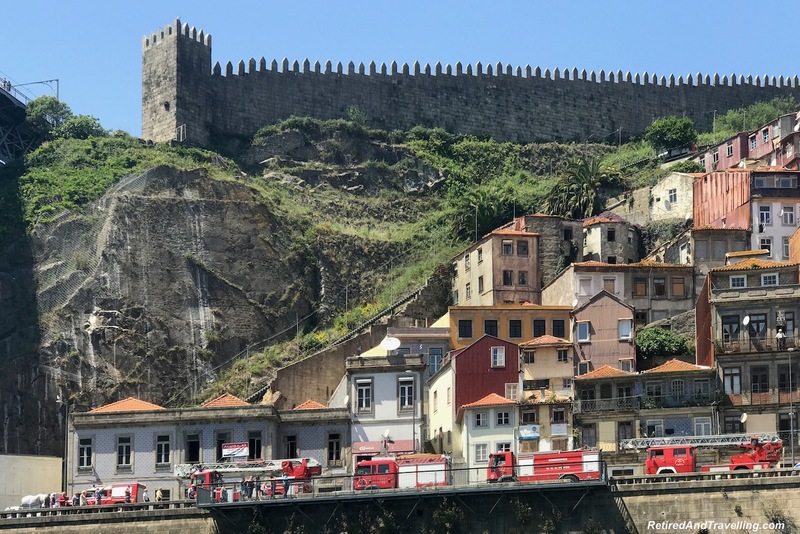 There are also a number of river cruises that will take you up the Douro River Valley. 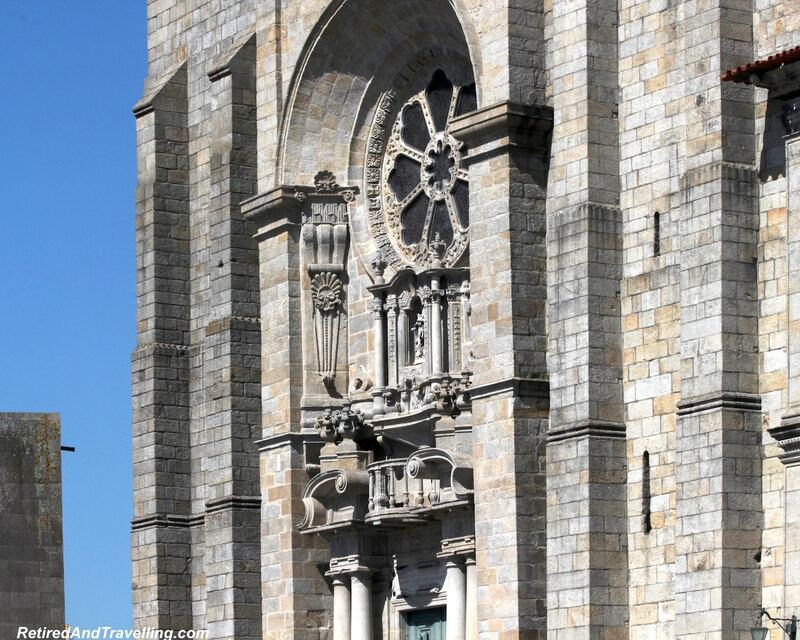 It is also possible to go north to Braga and Guimaraes for a day trip. 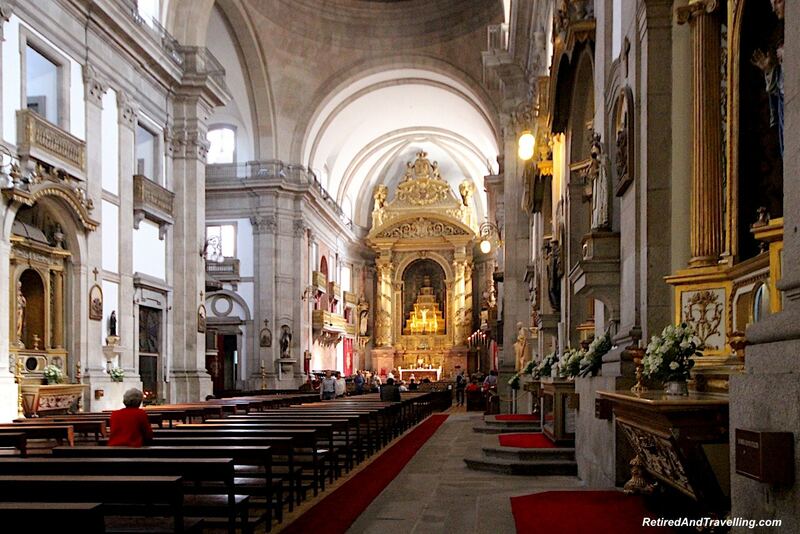 You can also do a day trip south to the university town of Coimbra for a day. 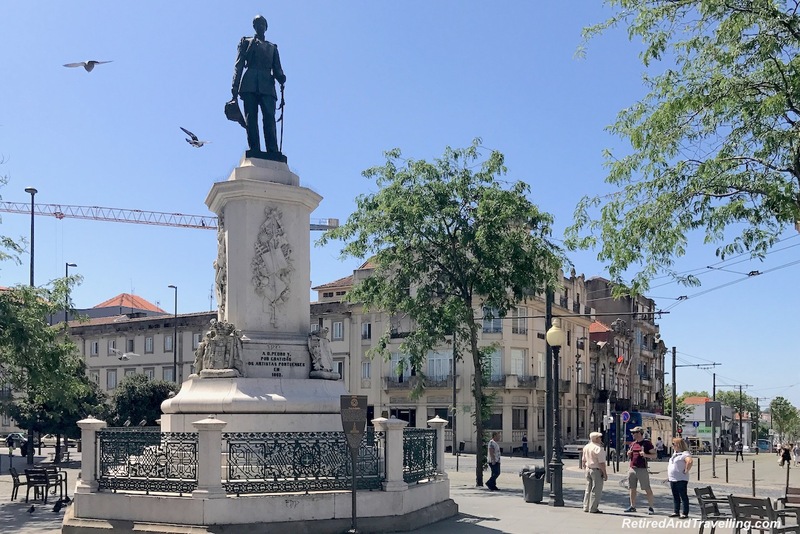 We visited Coimbra next on our trip back to Lisbon. 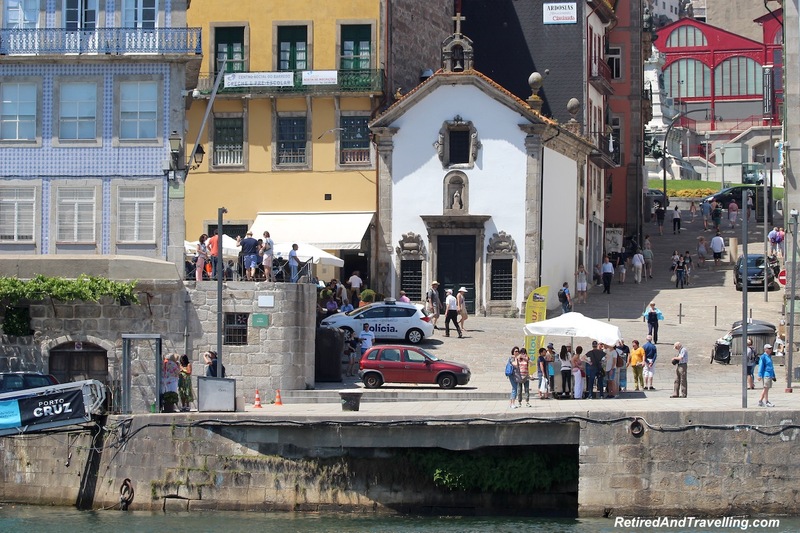 There are a lot of things to do in Porto. 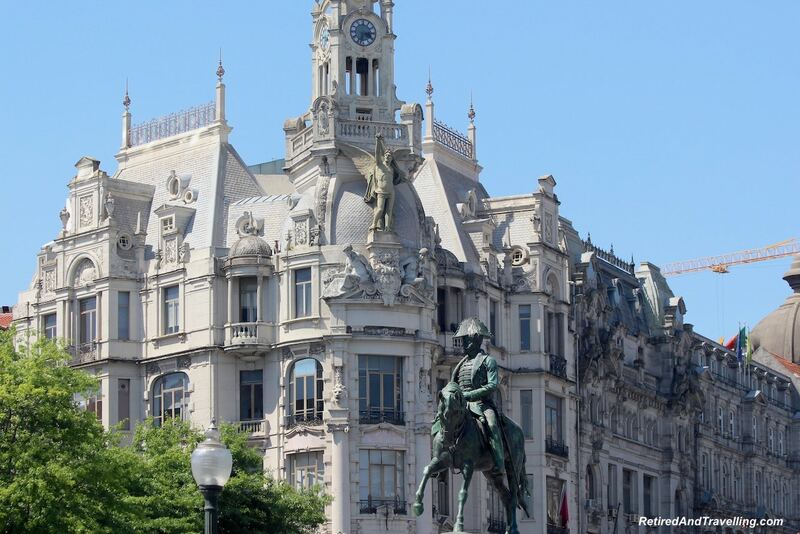 It is a great city to visit. 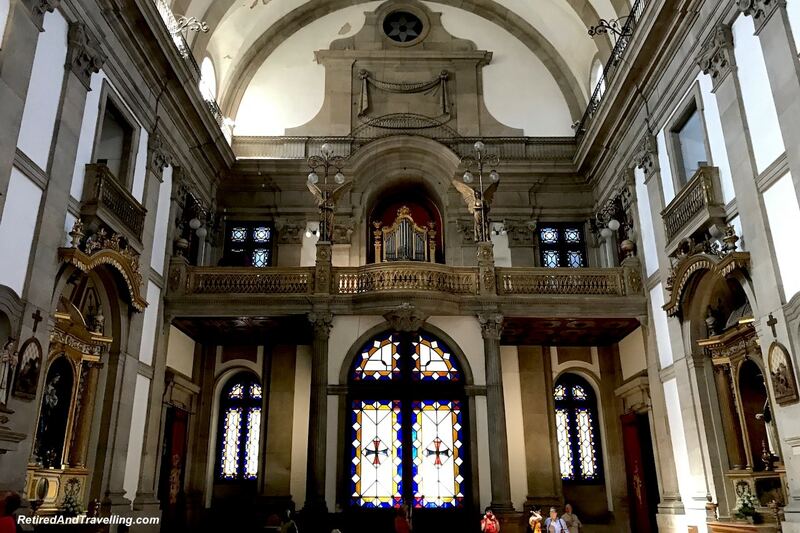 We got a good view of the city in 3 days but will need more if you want to explore all of the museums and the church interiors. Everywhere we walked we found beauty and art. 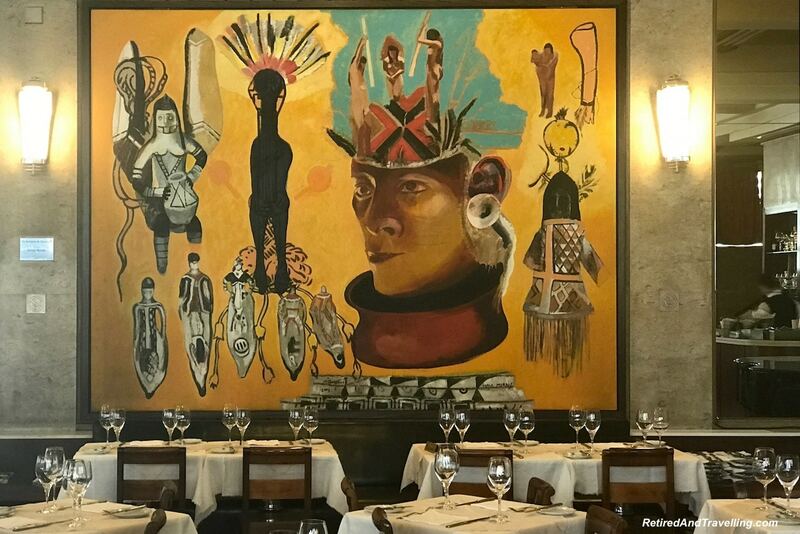 Even when we explored the cafes in Porto, we found art showcasing the great food. 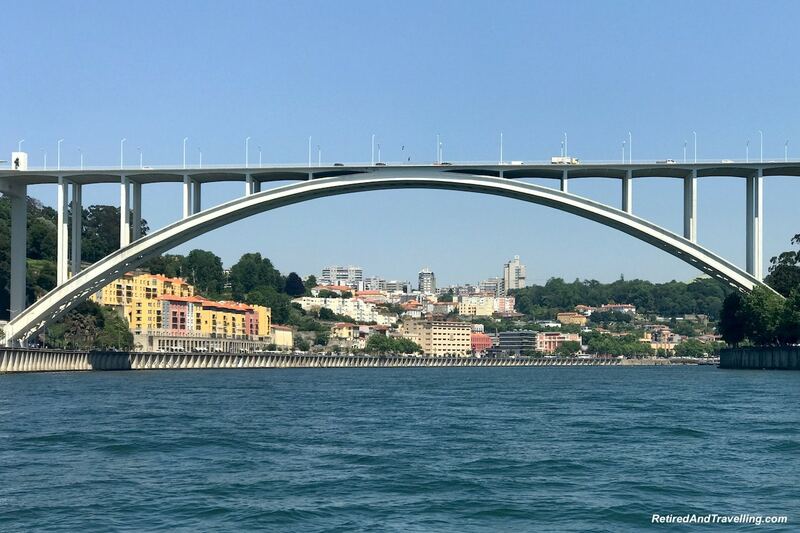 A cruise of the Douro River in Porto gave us our first view of the six bridges that cross the Douro River river. 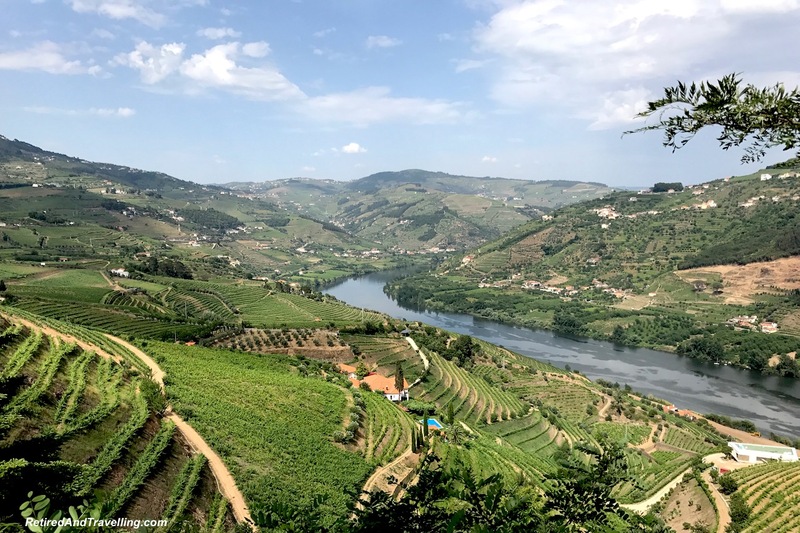 When we wanted to more, we explored the wine area with a trip up the Douro River Valley. 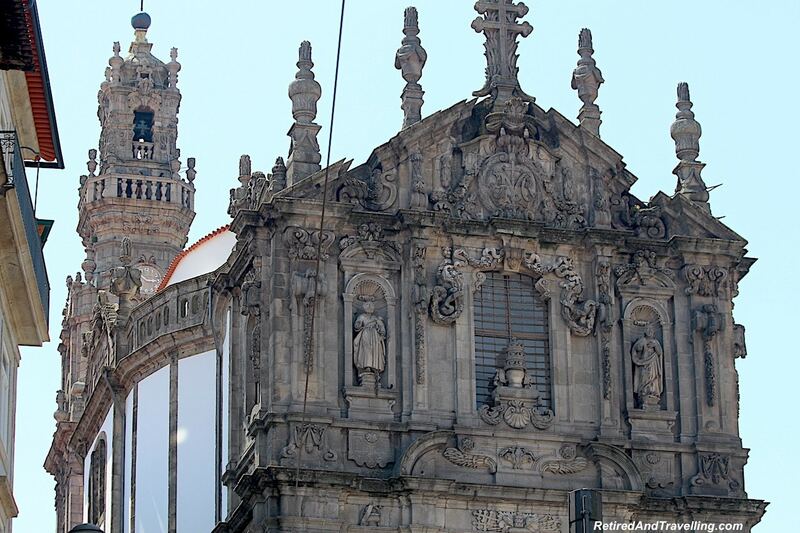 Once you are finished exploring Porto, there are a number of day trips you can do from Porto. 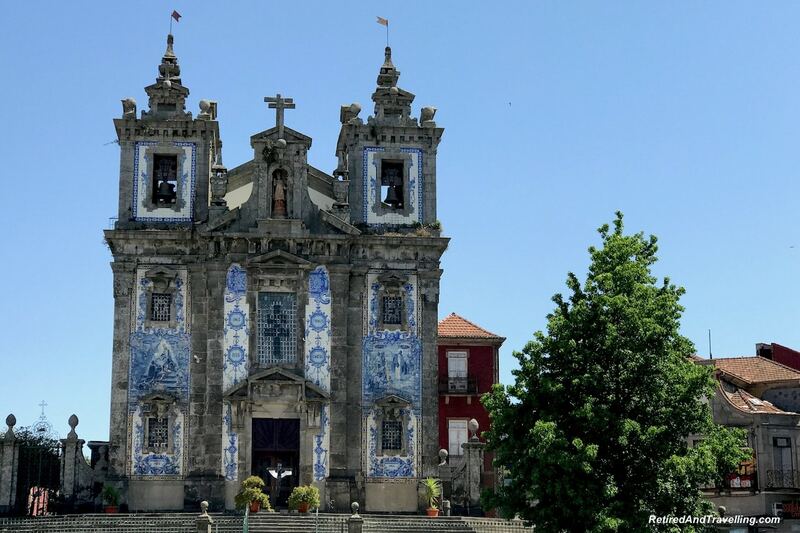 What was your favourite of the things to do in Porto? What did we miss that we should see on a next visit?